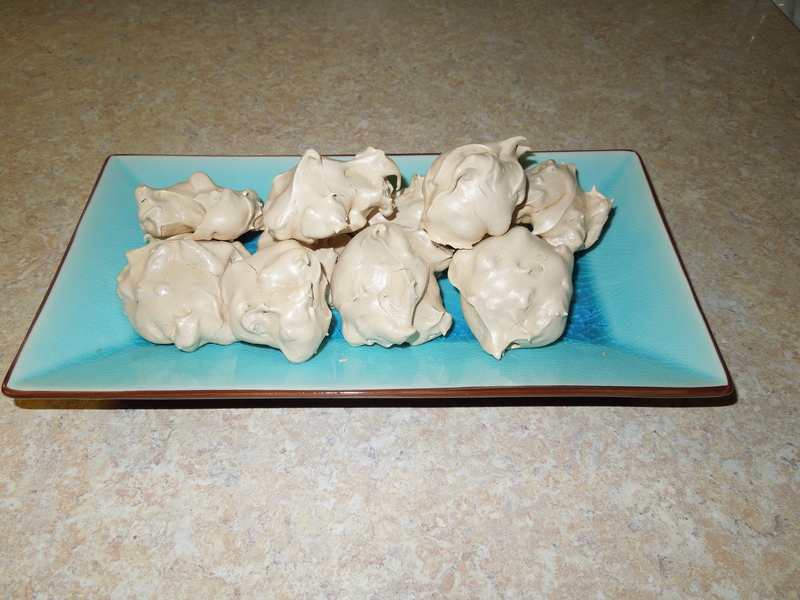 It’s been a few weeks since I shared a recipe on the blog, so I thought it was time again. This recipe is one of our summer favorites and when I made a round of these this past weekend, I seized the opportunity to load up the camera with the easy how-to steps to share with you. There are very few measurements in this recipe because the flavors are all based on your personal tastes and, as the cook, you taste and adjust as you go. You can double, triple or even cut this recipe in half and it always works. The package clearly says, “deveined” but I never trust that printing. Let’s talk about that for a second. If you are an experienced cook, you may already know what I’m about to say, so you can just sit back and nod in agreement as you read along. 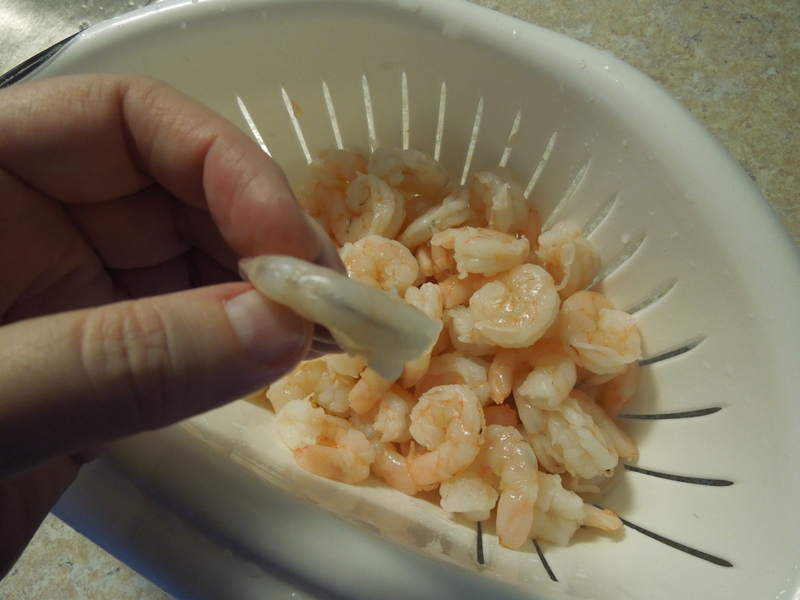 If cooking with shrimp is new or intimidating for you, I want to give you some real knowledge to make it approachable. …and then scrape the vein out. That black stuff you see is the vein. This may seem like a lot of work, but I’m going to speak very frankly here, so put down your drink. The “vein” is technically a “vein” in the biological definition of the word. 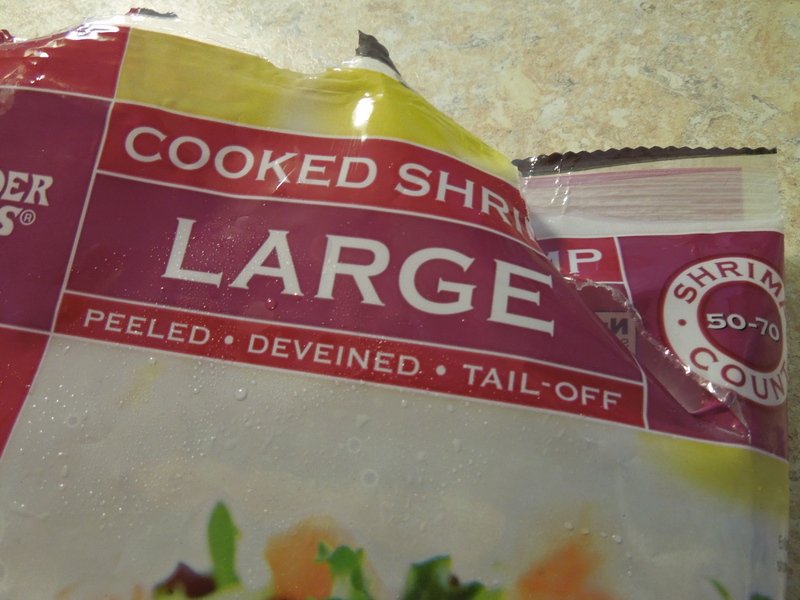 However, it is also the digestive tract of the shrimp…which carries everything along its body the same way ours does. Take a sec to think about what that involves. You with me? Get that vein out of your food! 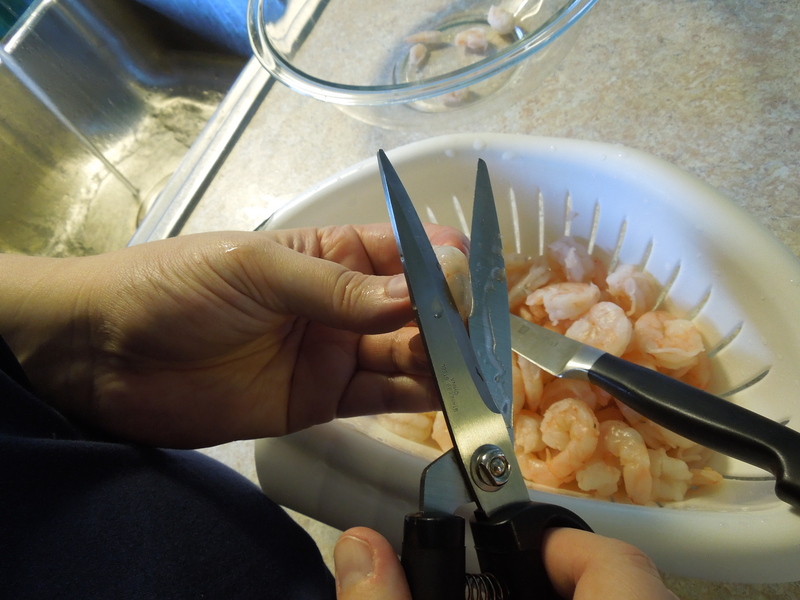 If you are worried about using a knife to cut into the shrimp, you can use a pair of kitchen scissors (the type you use for food only) to cut open the shrimp and then use the knife to clean the vein out. 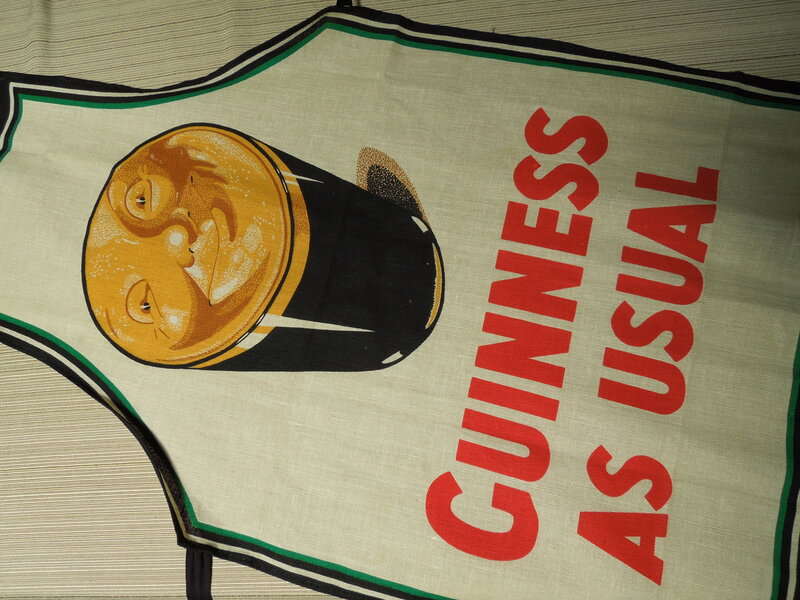 …all ready to do your bidding in the recipe. 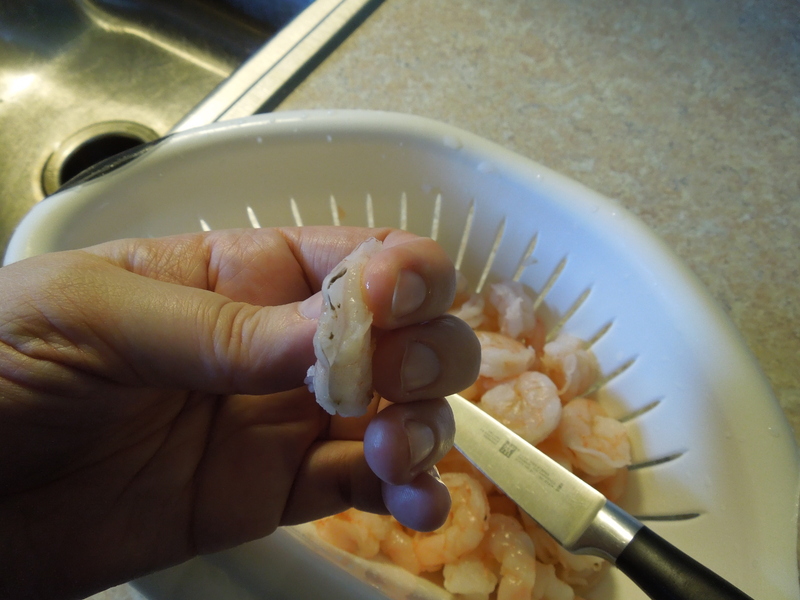 Plus, you’ll enjoy it more knowing it’s clean shrimp because you prepped it yourself. See, that wasn’t so much to do! Now set that bowl aside and let’s get the recipe going. 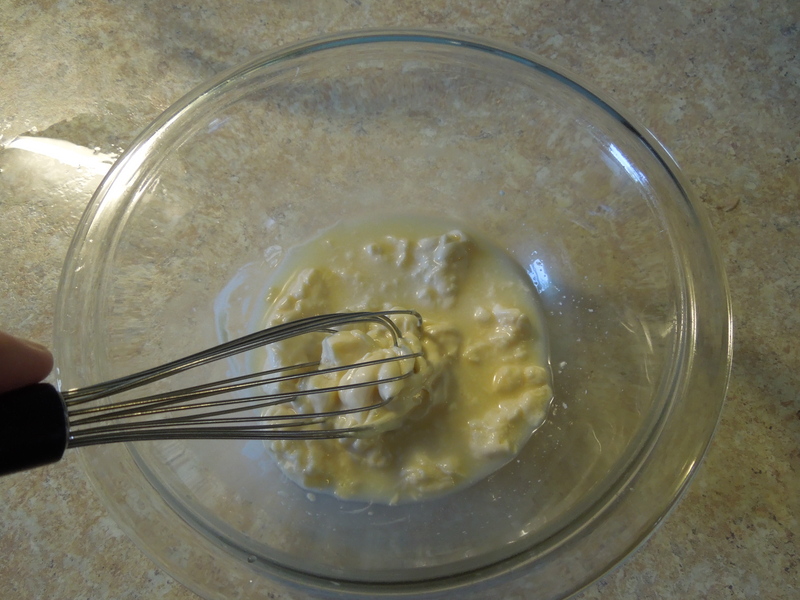 We start the recipe mixing by putting a couple of spoons of mayonnaise into a small bowl. 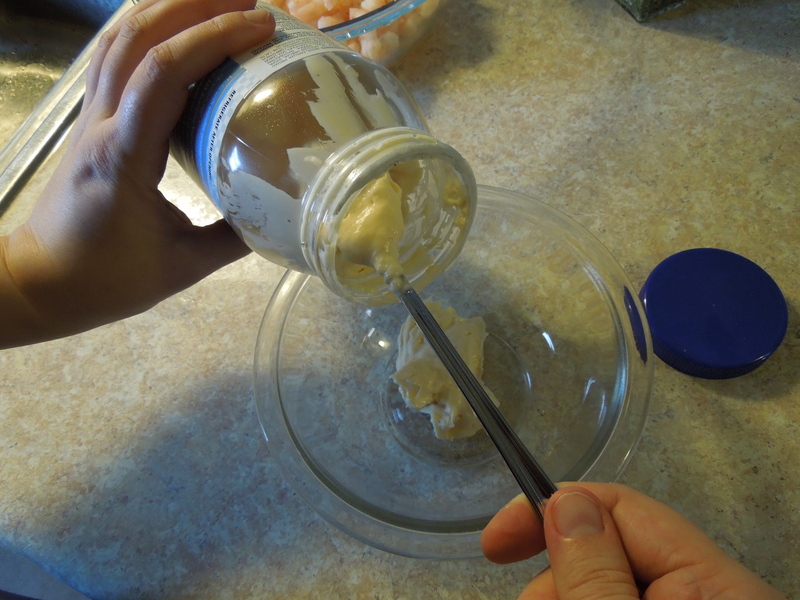 I’m using an iced tea spoon to get mine out of the bottom of the jar and into the bowl, because I find it easier to reach the mayo and my hand doesn’t end up wearing mayo like it’s a lotion. 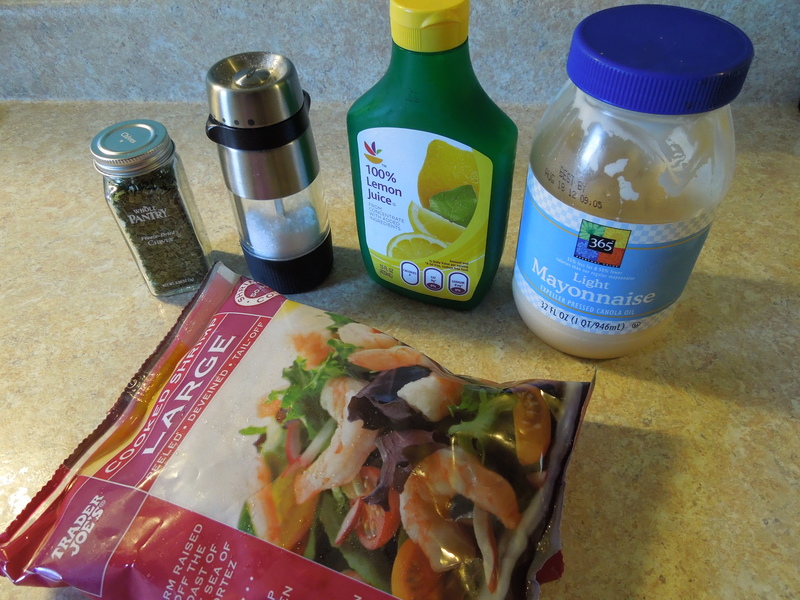 …and whisk it into the mayo. 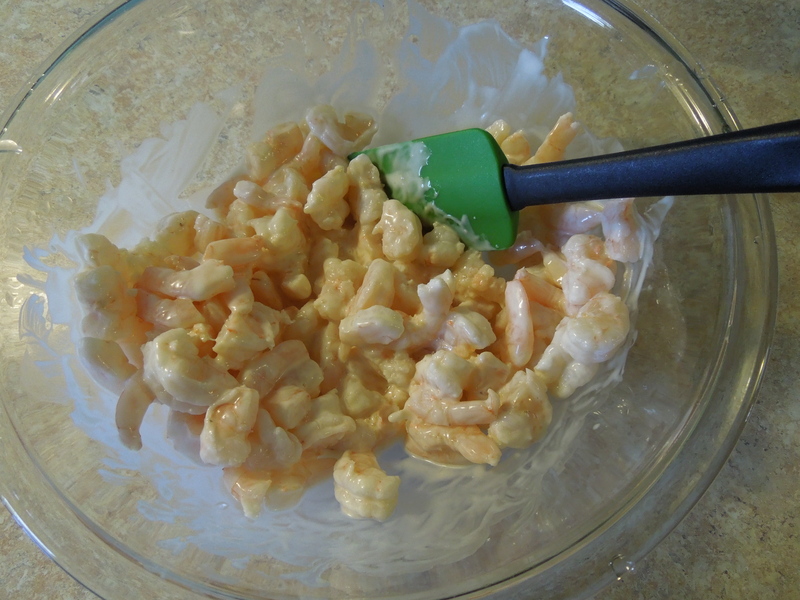 The addition of the acidic juice is going to break down the mayo a bit and make it all lumpy. 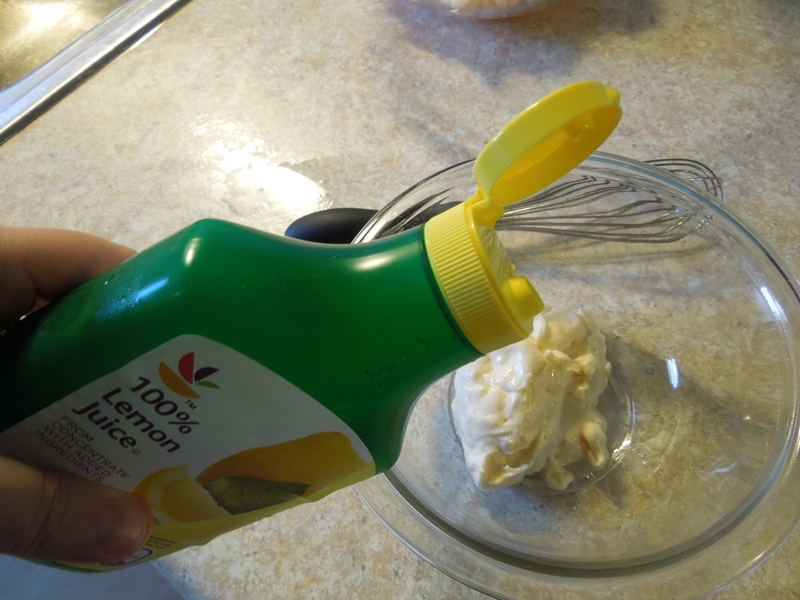 If you can’t taste the lemon, add just a few more drops of juice to the mayo mix and whisk it in well. 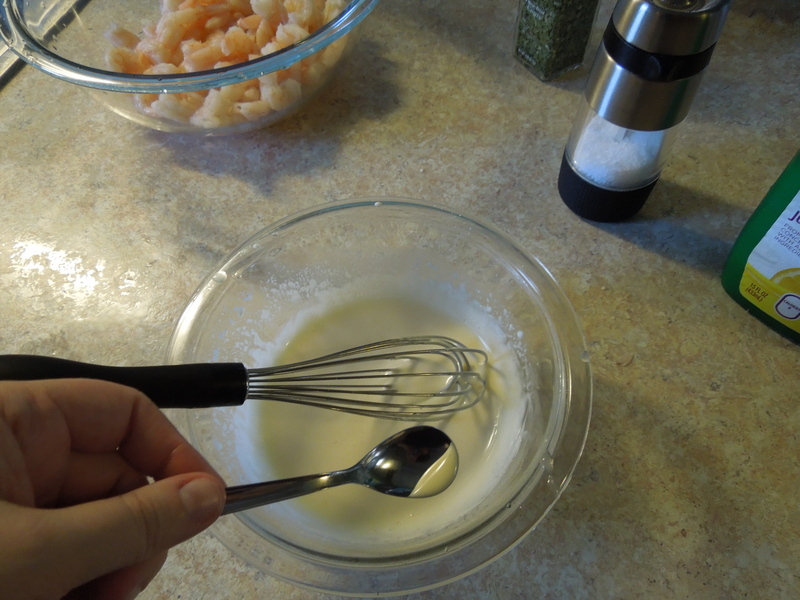 If the lemon flavor is very strong for you, add a tiny dollop of extra mayo to the bowl and whisk it in well. Taste the mixture again (with a clean spoon!). 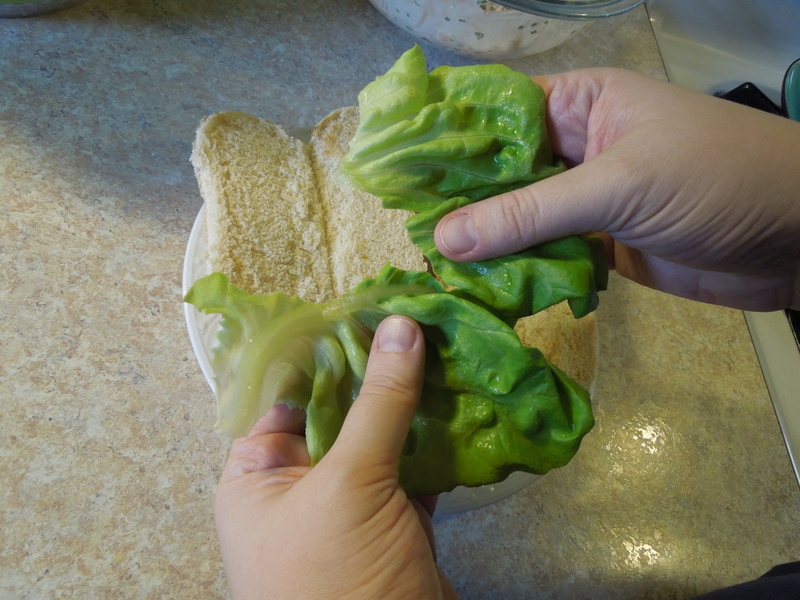 Keep adjusting as you need to, using only very small amounts of mayo or lemon juice as you go. 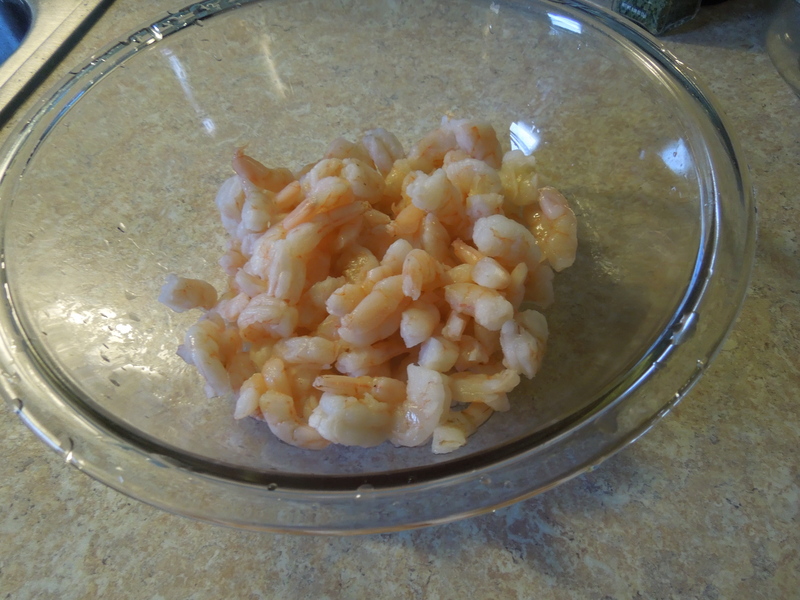 Worst case scenario: you might have a little bit more sauce than you need when we add it to the shrimp. Not a budget breaker. 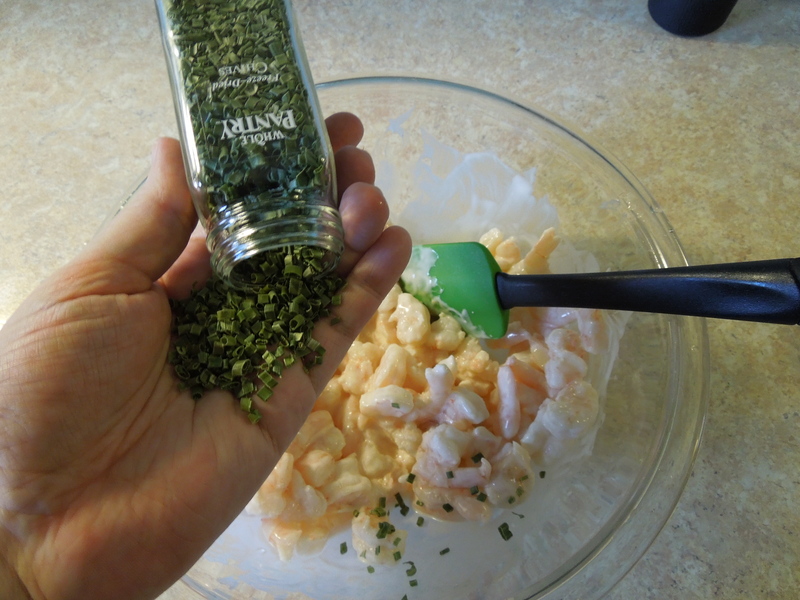 Now we add a little bit of salt to the sauce to keep that seaside flavor of fresh shrimp within our sauce. You don’t need a lot. 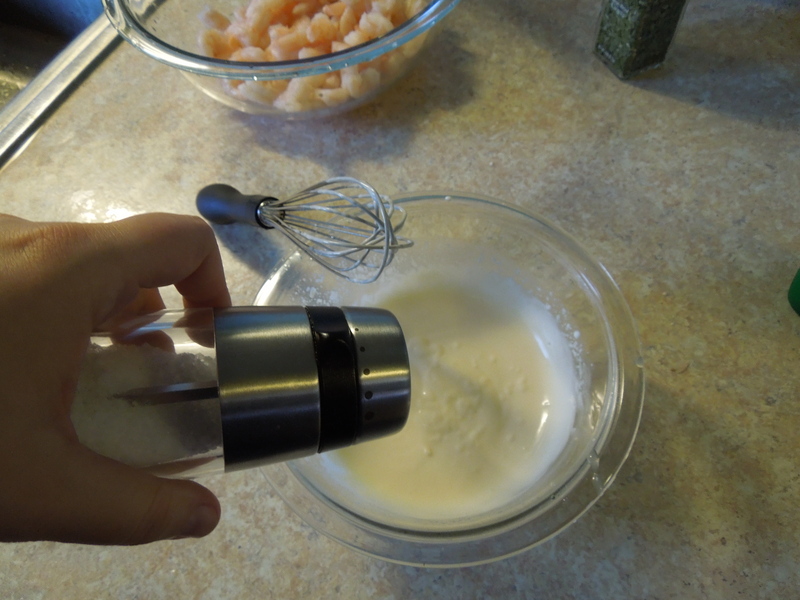 Just whisk it in. Be sure to taste the sauce again to see how you are doing. Hey, look! We are cooking like our great-grandmothers! Measuring by hand, tasting by instinct. This is the way to better cooking and more kitchen confidence. 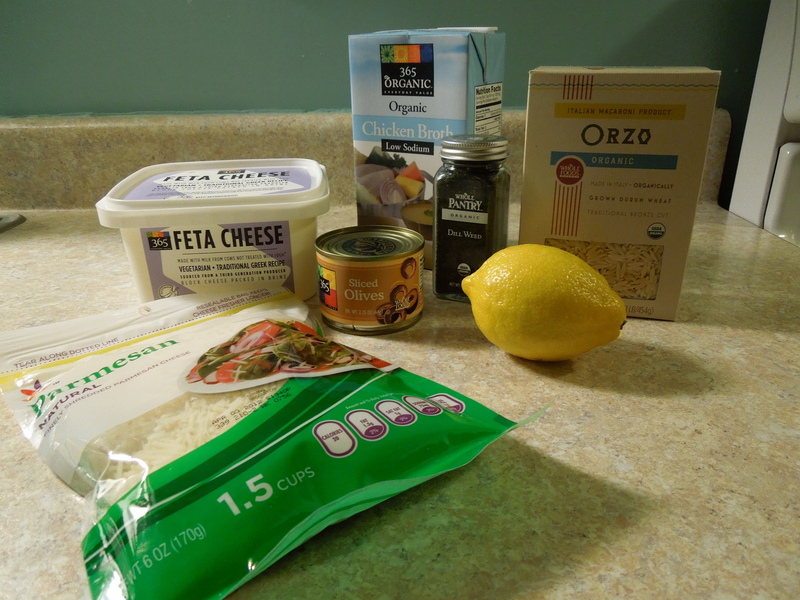 One step and one recipe at a time! 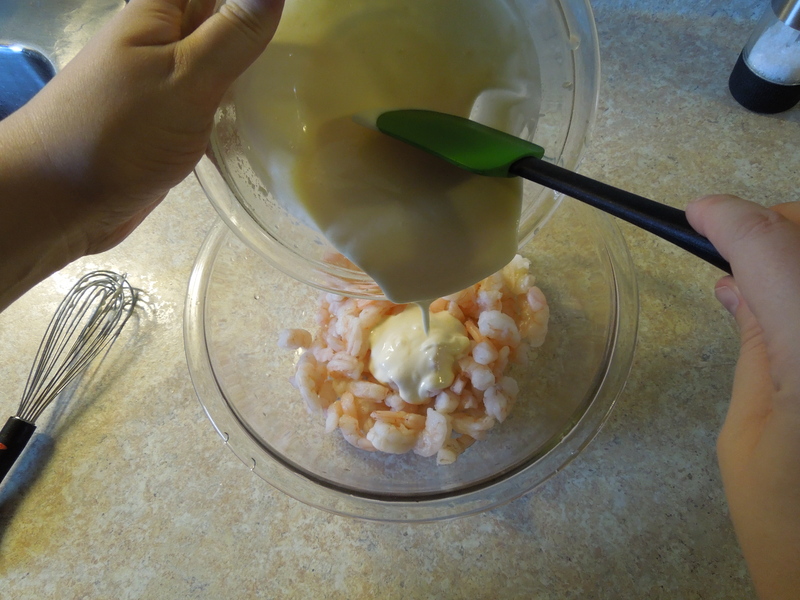 When you have your sauce tasting just right…creamy, with a little hint of lemon in the end of the bite and just a touch of seashore-like salt… we are going to add the sauce to the bowl of shrimp, slowly, not the other way around. 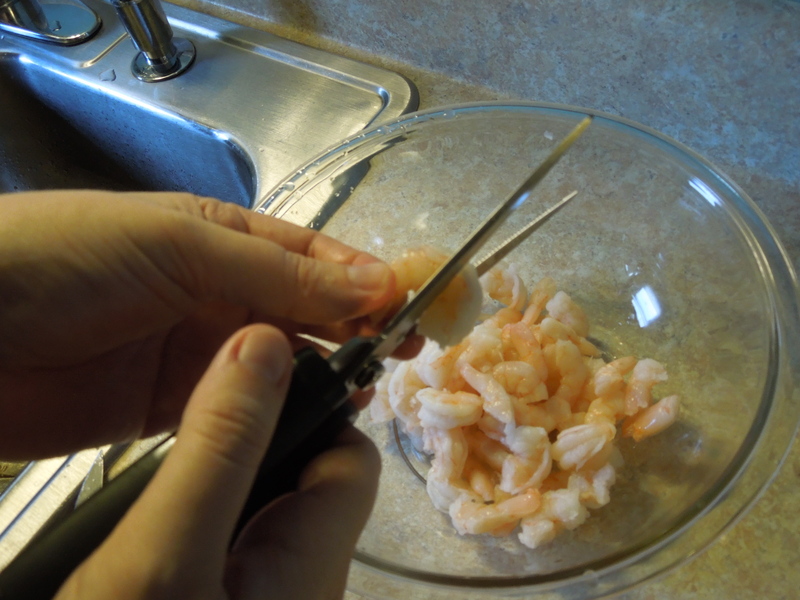 We only want enough sauce to bind the shrimp well together. There should be a light sauce on your shrimp, not some shrimp in a bowl of sauce. The shrimps are the stars of this dish, so pamper them by gently folding the sauce around them, not stirring the bowl up quickly. 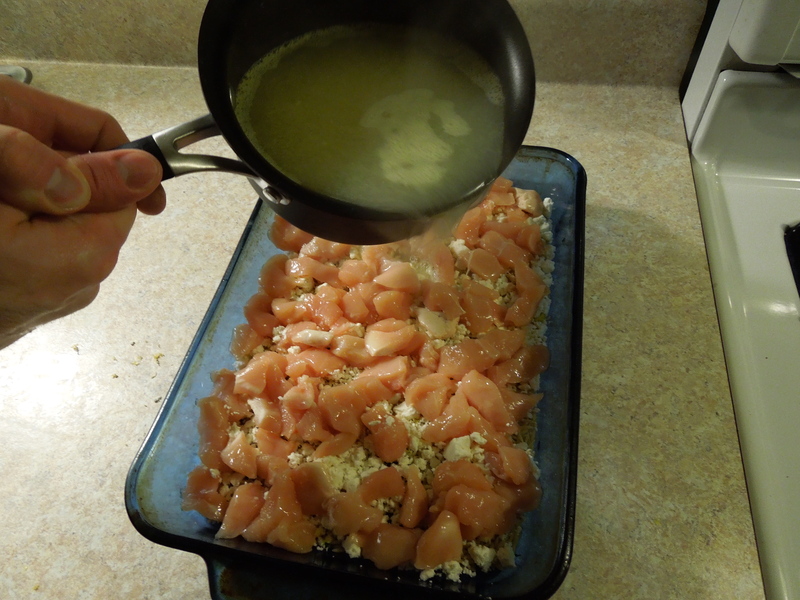 …and fold it gently into the mix. 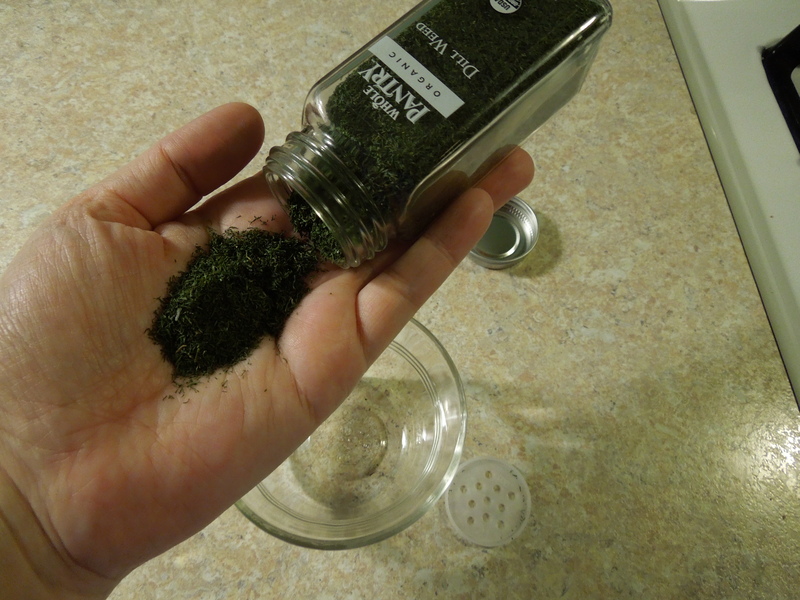 (I think am getting better at taking these spice-bottle-in-one-hand, camera-in-the-other shots.) 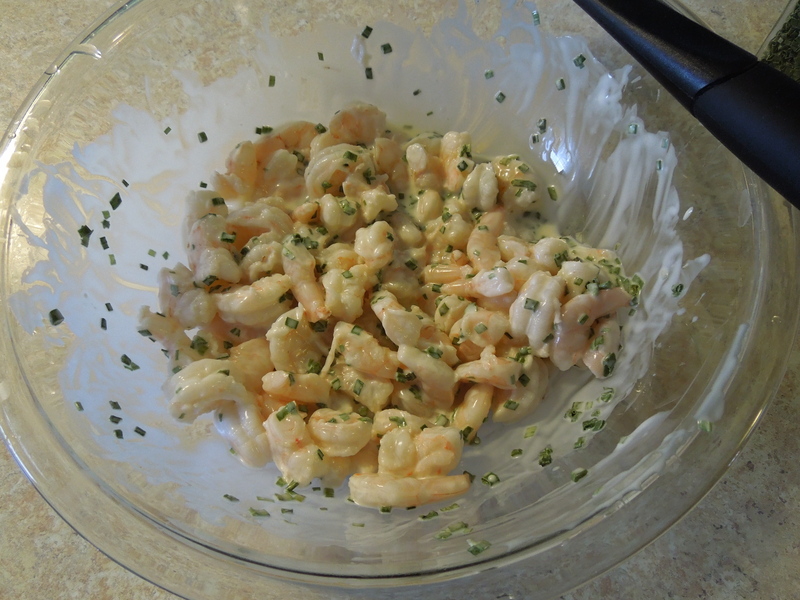 You can add more chives, as you need to, to get an even distribution in the shrimp. I generally like to chill this recipe right here for a few hours before serving. 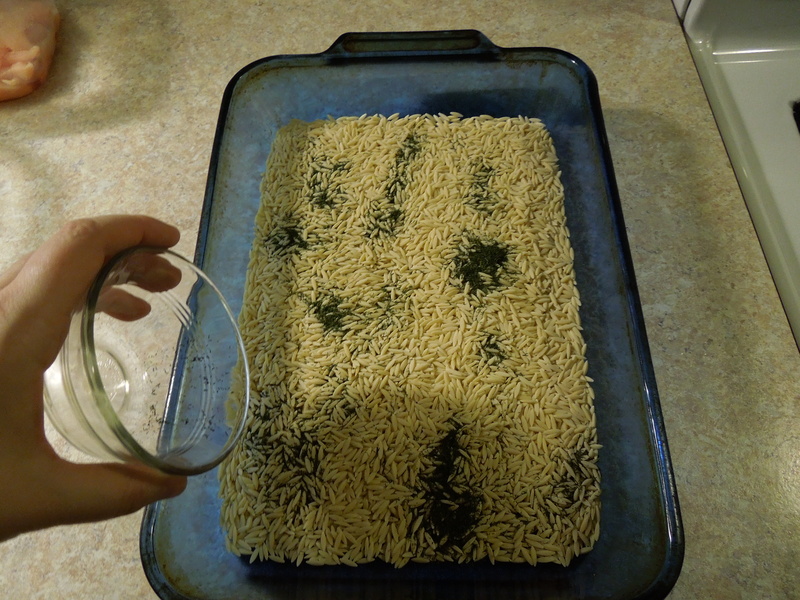 I just toss some foil over the bowl and pop it in the fridge for a while. I like the flavors to bond a little together. But if you don’t have the time, you don’t have to. Whatever fits your schedule. 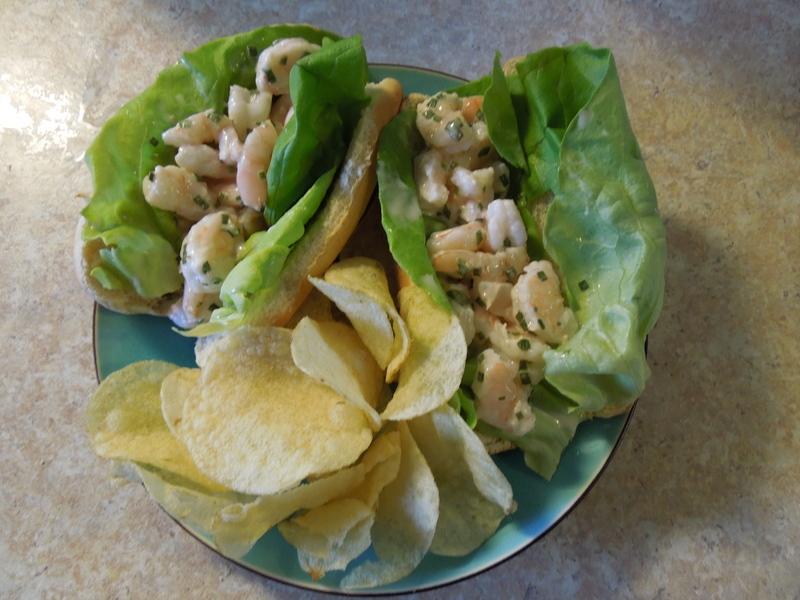 I know, you can barely see the rolls now, but you want this leafy green balance to all the creamy shrimp while still keeping the crunch of the toasted roll. It all comes together in the end, trust me. 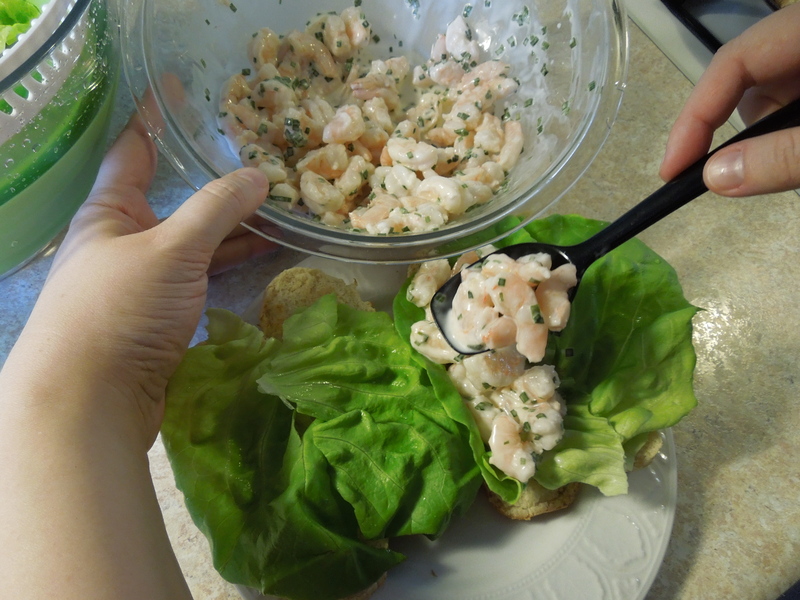 You can now ladle your shrimp onto the roll and the lettuce holds it in place, without letting the sauce soak into the bread. 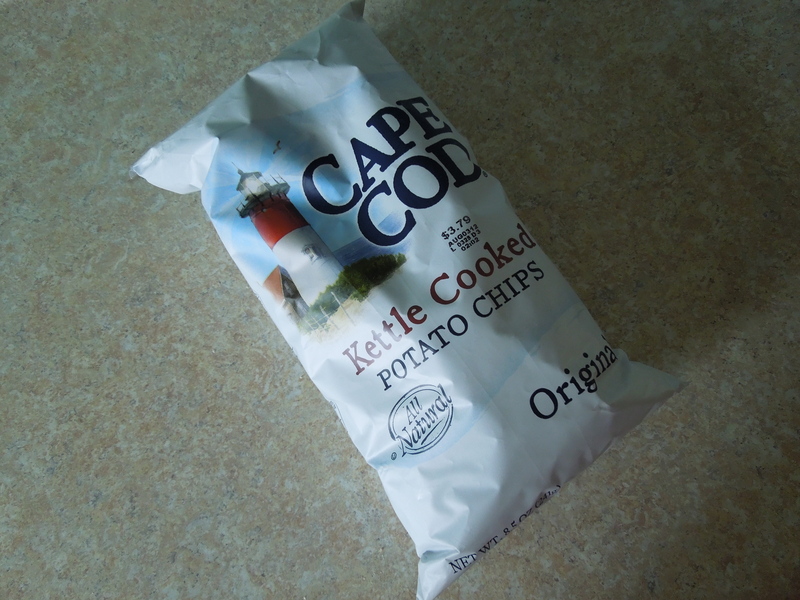 …use the local chips. Time to eat! 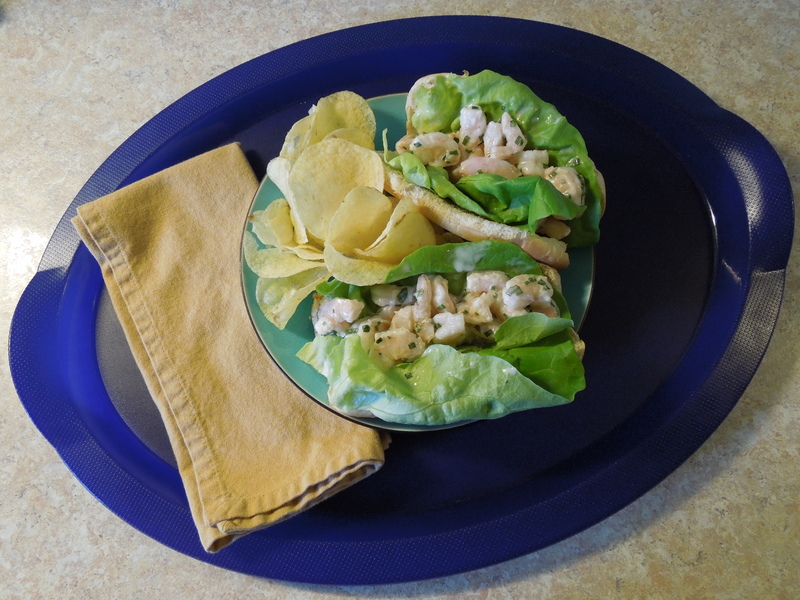 I’m telling you all of this to share that these shrimp rolls wrap up beautifully for picnics in foil. 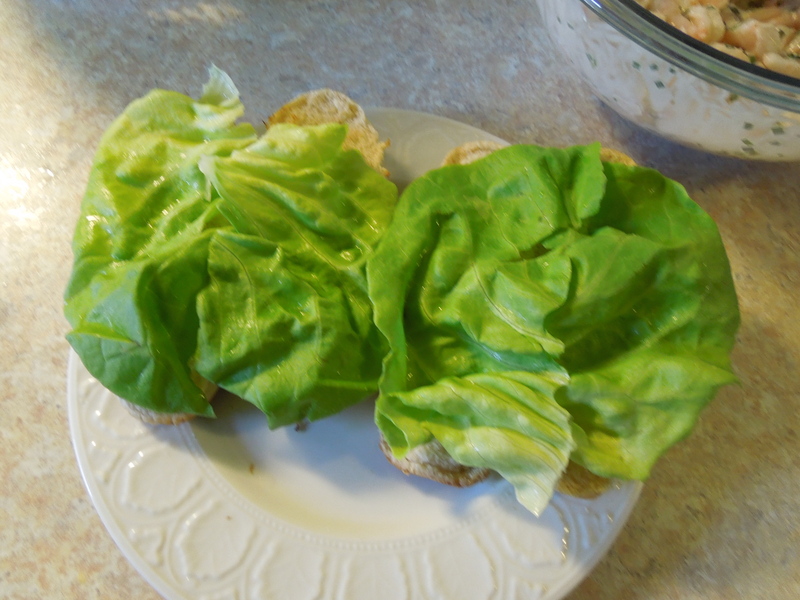 Because the lettuce leaves keep the shrimp mix from getting the bread soggy, you can even prep this recipe completely the night before your party/picnic and just keep the rolls wrapped in your fridge until go time. Easy packing, easy clean-up! 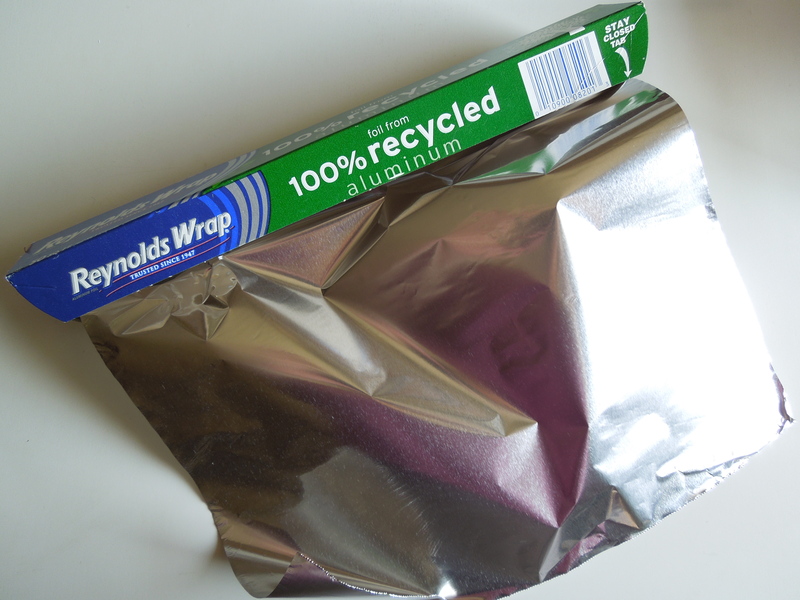 And here is my very own PSA: Please try to use recycled foil in your home, and then be sure to recycle it again, so that the planet can stay enjoyable for all of us to share a picnic. Little steps like this in our daily lives can make a big difference! Does this recipe sound good to you? What makes a great picnic sandwich? 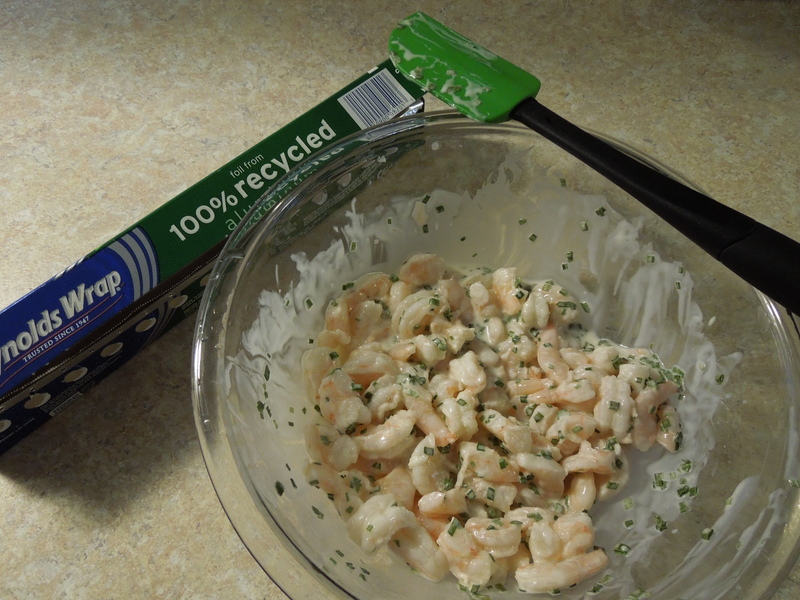 Do you make a great seafood salad in your home over the summer? 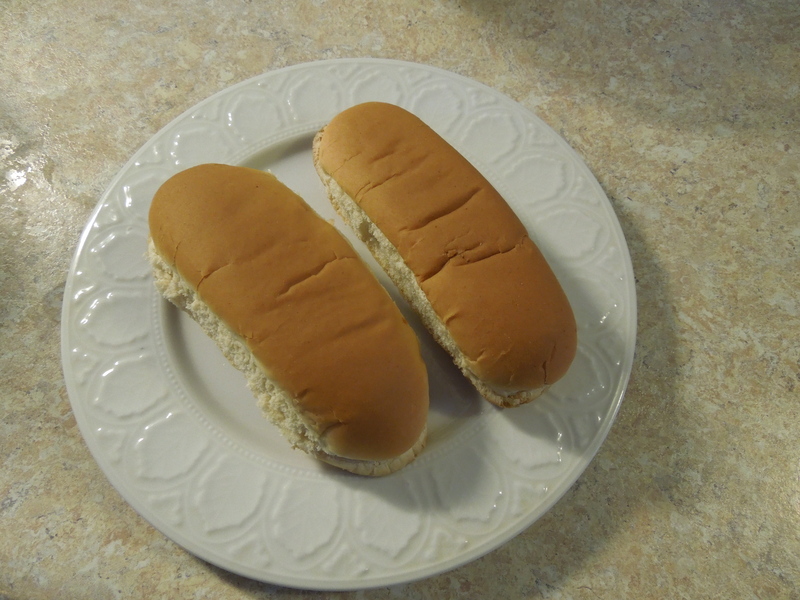 Share your opinions and recipes in a comment! If you liked this recipe, there are more to come this summer. You can also always explore the recipes I’ve shared in past posts by clicking on the Savoring Home Recipes link on the side bar. Hmmm. Are you noticing a theme here? 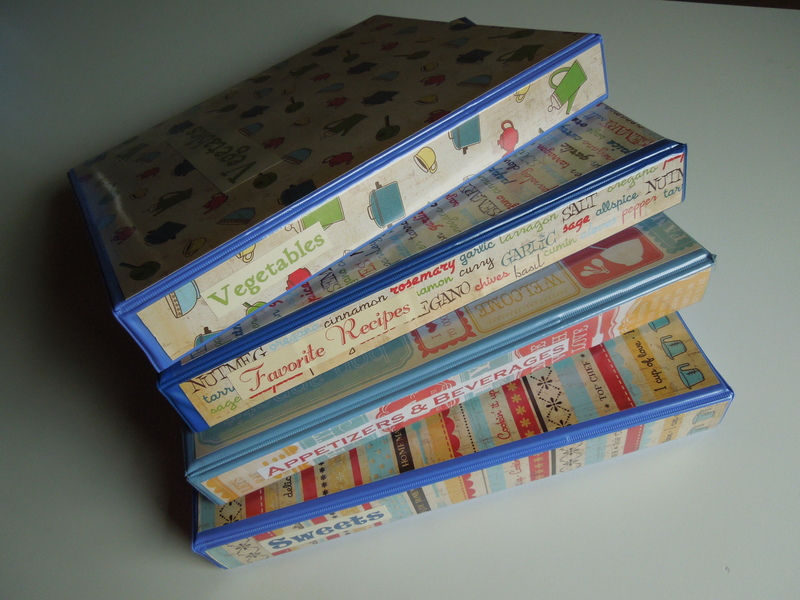 So, I’m making some pretty, custom and oh-so-affordable binders to store my recipes nicely. This is an easy project and I took pictures as I worked on it this past weekend to show the steps. Just keeping it real for you, friends. This project can be done in very little time and is quite satisfying when you are done. To start the process, I bought a set of clean, 3-ring binders. I chose binders with those clear pockets on the exterior so I can decorate the covers inexpensively, while still keeping them highly wipeable. 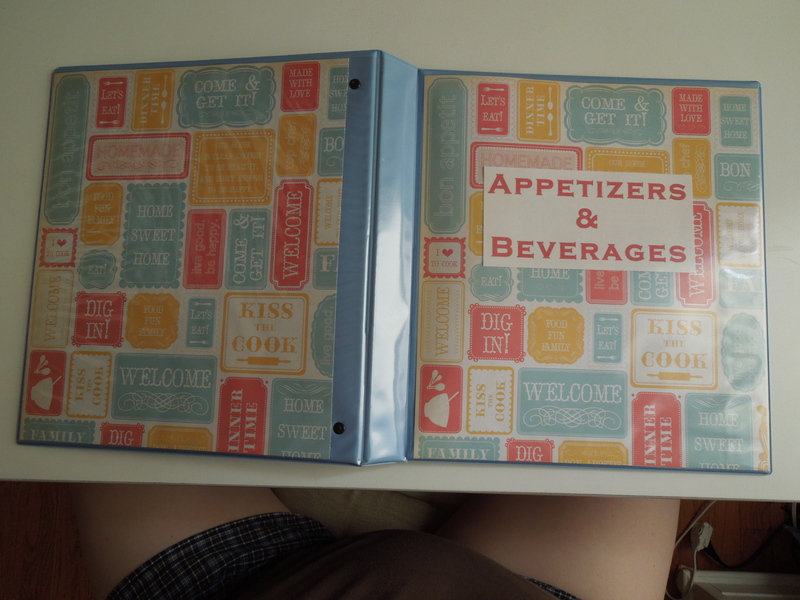 I also chose binders that were all variations on the color blue, because I like blue and it looks nice in my kitchen. I already know these binders are all going to sit next to each other on a shelf, so why not make a personal choice of a happy color? In full disclosure, I did grab these binders from several different stores. I noticed that most stores only carried one or two versions of any color. 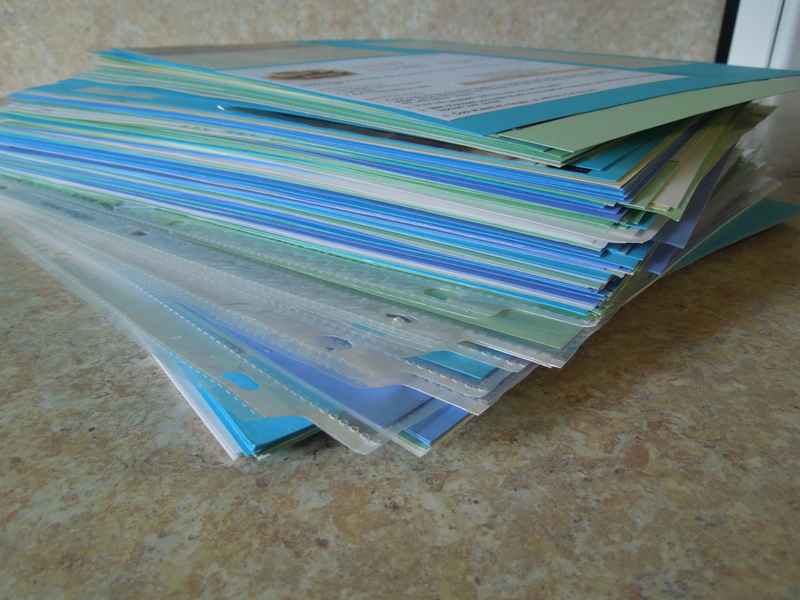 I wanted more variety, especially knowing each binder would have a different topic. So, as I ran my regular errands around town, I used Target, Staples and Wal-mart to find my colors and stay within my budget. 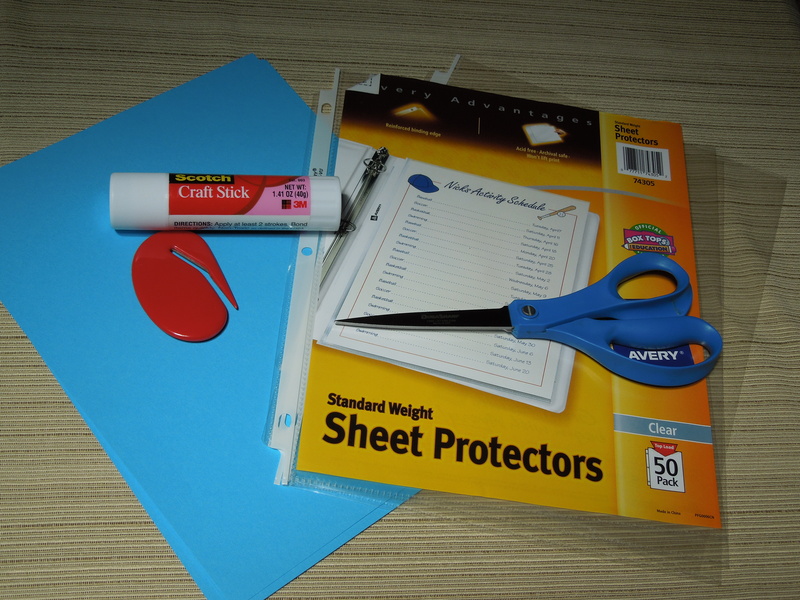 Next, I popped into several art supply stores to pick up some pretty scrapbook papers to use in the binder cover pocket. Again, I just built this into my errands and grabbed what I like. I am not a scrapbook creator, but I am happy to reap the rewards of the many cheerful and bright papers that are now available for scrapbooking fans. 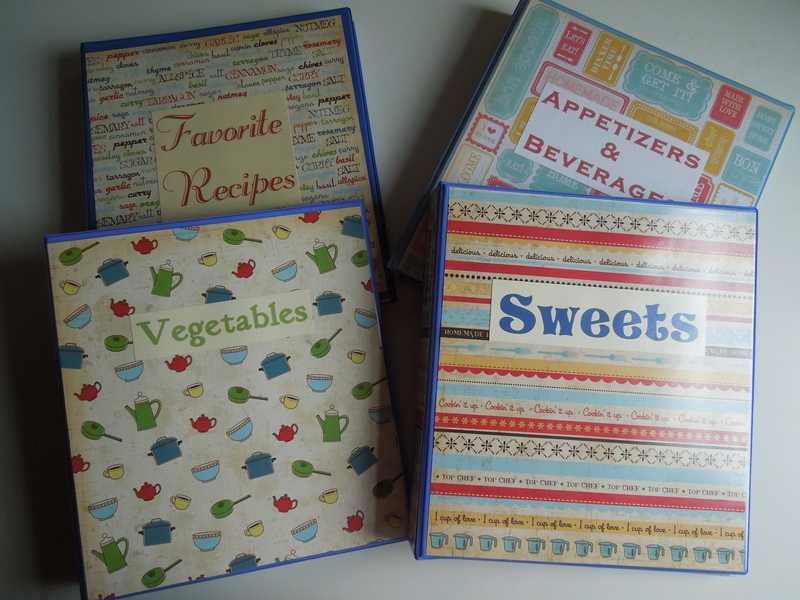 I chose kitchen-themed papers, to keep the binders looking united and fun. Of course, you can choose whatever you like for your home and personalize it for just a couple of bucks. I caught a sale and the papers I chose were under $5 total. Very budget friendly! I’m matching my fancy-schmancy papers to each binder to make a collection of related-looking finished books. I may switch these papers around with the binders as I make each one. I’m not sure about that aqua binder on the far right in the picture below. A little too bright next to the others, I think. 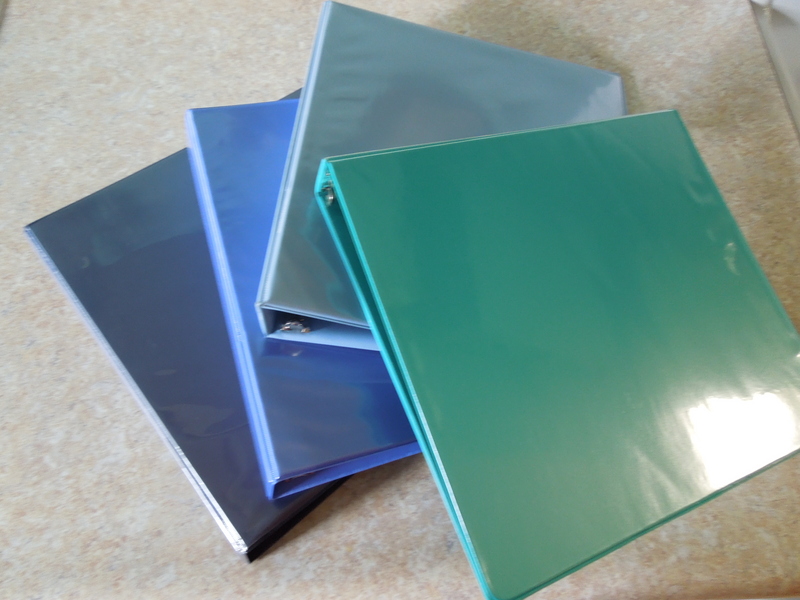 As for subject titles, each binder will have its own general topic. 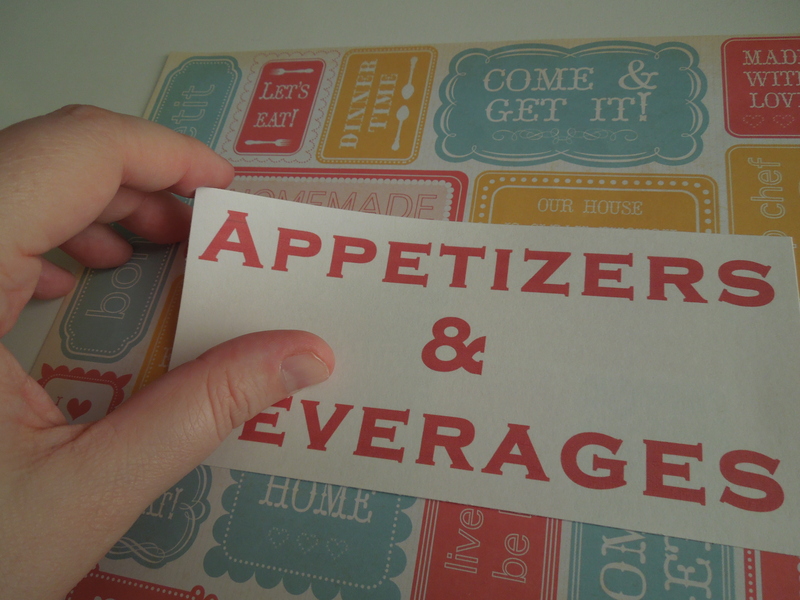 For example, I’ll make a binder called “Appetizers and Beverages”. 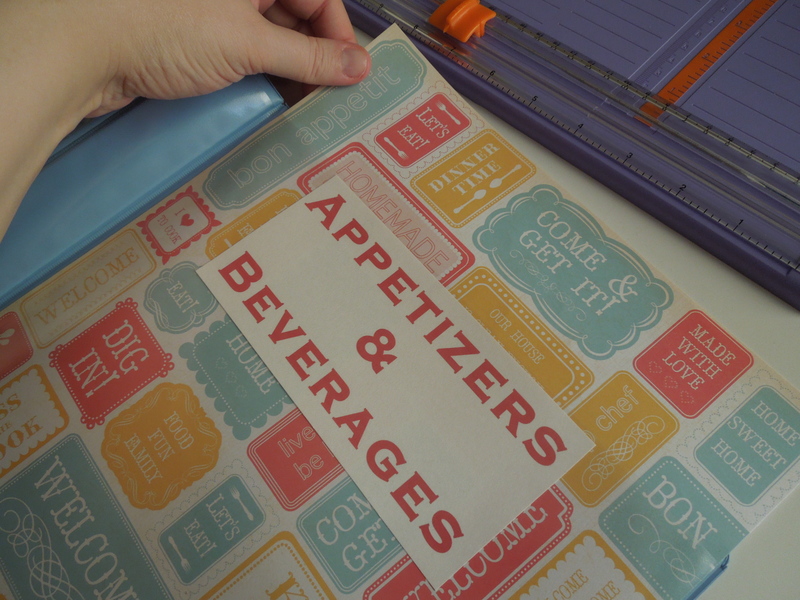 This binder will hold the few remaining cut-and-pasted recipes, so I know the look I’m going for with each finished dish. (I was discussing this dilemma in this post.) 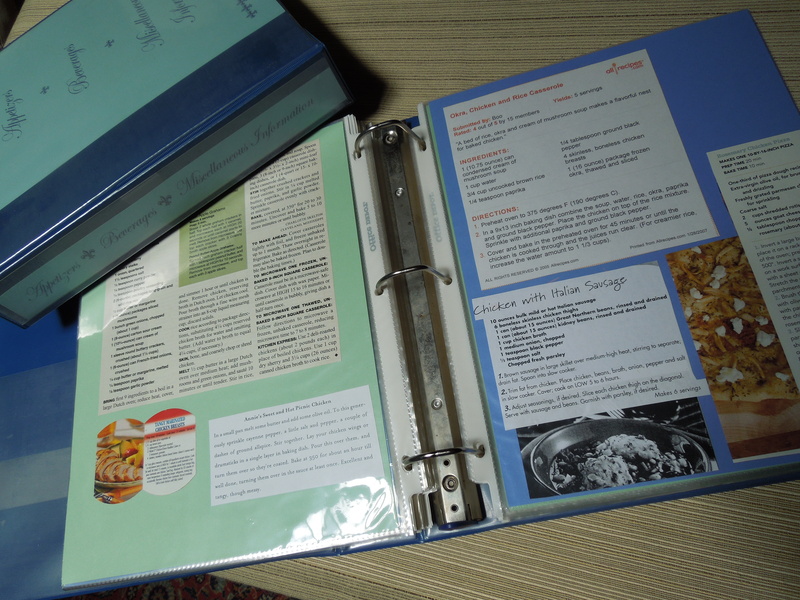 I’ll probably sort the recipes further, somewhat, inside the binder, but not too much. I really want the freedom to just put the recipes in and know that they are there without creating a time-consuming index or page number system. Back to the work: To cut the papers to fit each binder cover, I measured the cover pockets individually. You may question why I would go to the effort to do this when I regular 8.5×11 sheet of paper fits easily. However, I want my binder covers to use as much of the pretty scrapbook paper that I can fit into each pocket, while also keeping it reasonable to get the paper down in those pockets with a snug fit. I used my trusty little Fiskars paper trimmer to make even cuts. 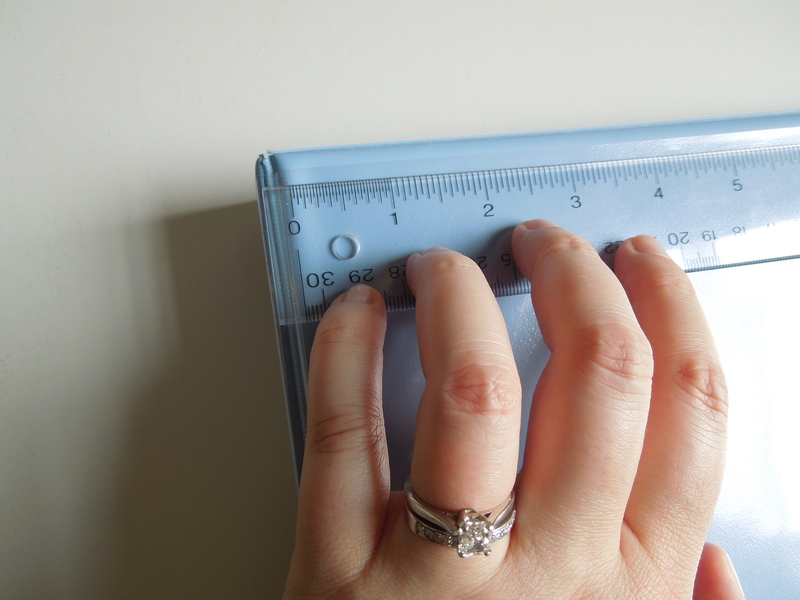 I bought this paper trimmer years ago, for a wedding stationery project. It has been so handy over the years since, for such a myriad of projects, I can’t remember how I lived without it before. It’s not big or flashy, and every now and then I need to replace the little cutting blade slide (which is very affordable to do), but it gets the job done and it stores very easily. I’m not plugging this product for profit or perks, by the way, just sharing what I actually find useful in real life. ….then slide the paper covers into place. I also like to put a little roll of tape behind the cover binder, just to keep the paper from shifting around as it get used. 1. Lay your binder open flat, cover side up, before you try to put the spine paper. 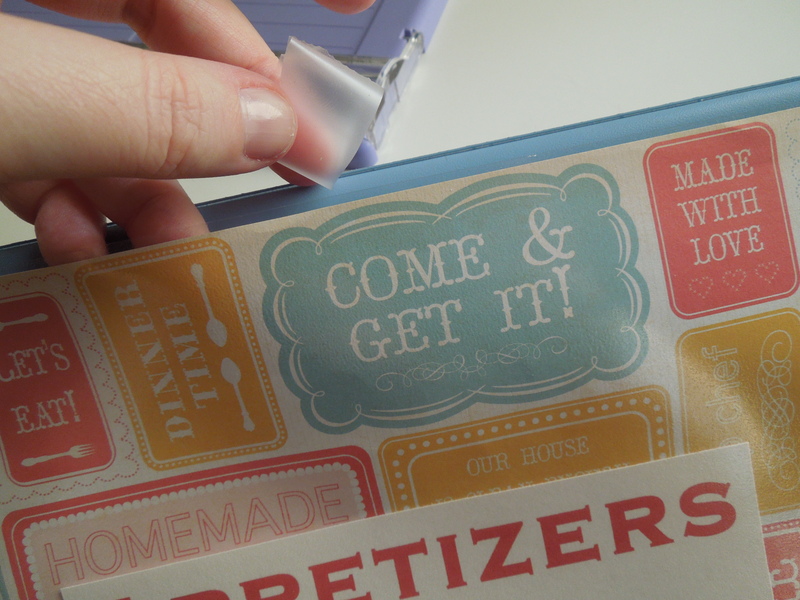 This allows the plastic spine pocket to have as much “give” as possible as you slide the paper further down. 2. 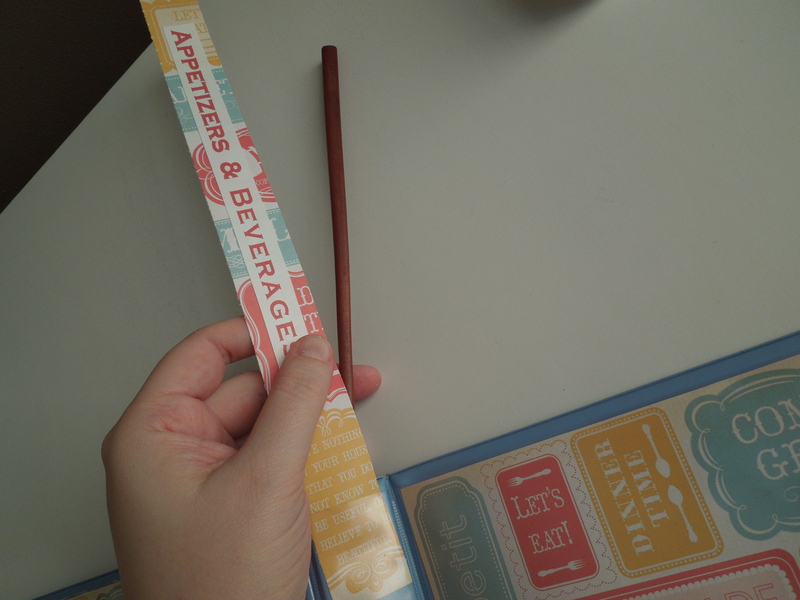 Use a chopstick to act as a guide when you slide the spine paper in place. You’ll never get your finger down where you need it to be in that little pocket, so don’t kill yourself trying. Take a deep breath and just work slowly, little by little, to ease that paper down where you need it to be. It may get a little wrinkled as you go, mine did, but you can work it all out with patience. All in all, I like the way these binders turned out and it made the cleaning out, sorting and typing parts of this saga seem more attainable. I can see where the truly loved recipes will go and as I get there, the paper organization is in place for immediate use. I can’t say that all the typing will get done as fast as these binders were put together, but I’ll get there eventually. The typing is happening and I think I am now ready to address another aspect of this project…. 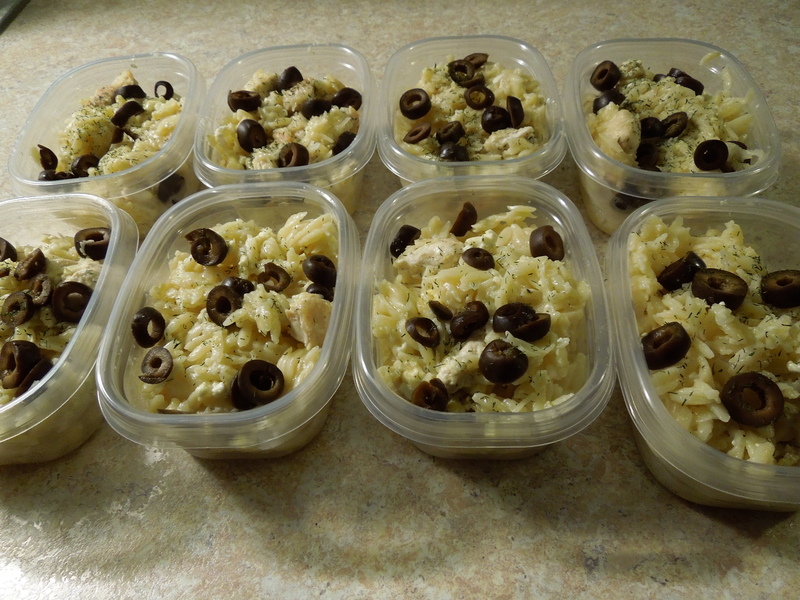 …all of the loose recipes I still have stashed for “later”. But that is a part of this saga for another day. Can you see how this custom binder cover would make a great gift idea? 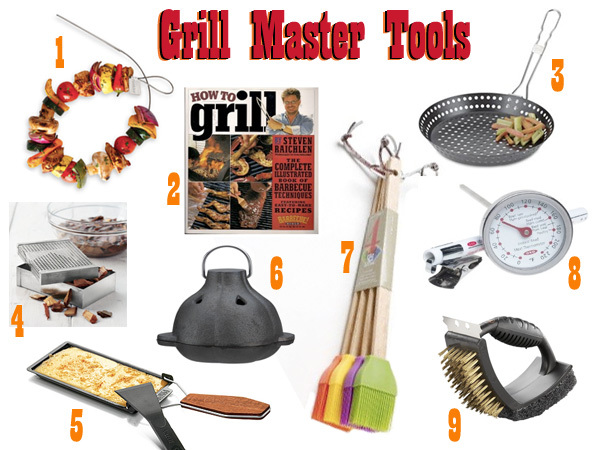 You could use it to build a cookbook of favorite recipes for almost any occasion. 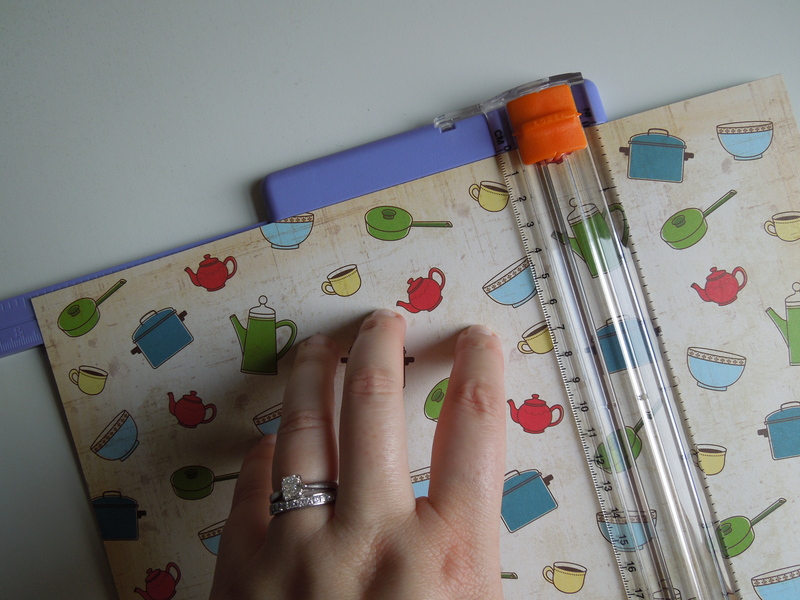 You could also use it to build a custom recipe book as a group-sourced gift for an individual, such as a bride or new graduate. 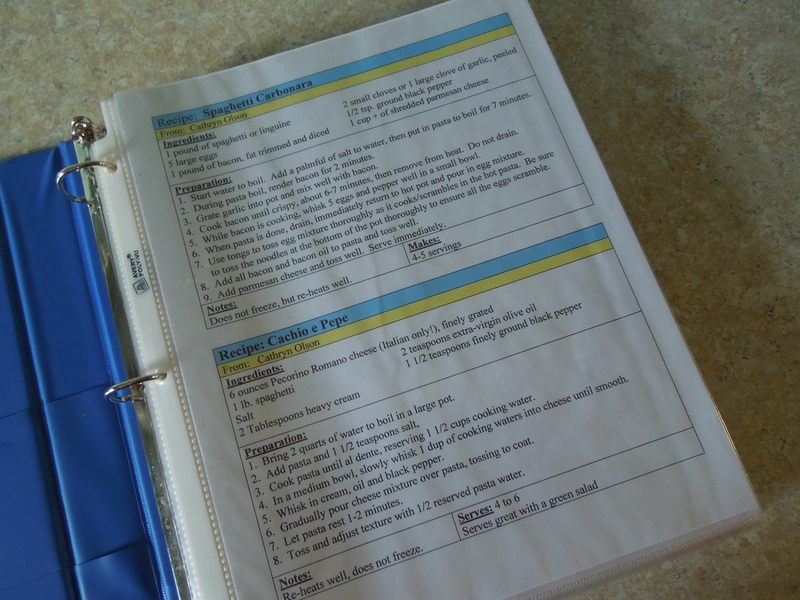 Each contributor simply completes a typed up recipe page and all of the pages are combined into the binder as a group gift. The customized cover would just make the cookbook all the more special. It’s an affordable gift, but very personal. Just a thought! Now tell me what you think of this project. I really want to hear your opinions. Am I a little too obsessive in my organization? Do you like the way the binders turned out? What would you do differently? Any tips for the next part of this recipe saga (all those loose recipes)? Blogs are for conversation, so leave a comment! If you liked this post, you might also enjoy the posts I have written about creating my All-Year Holiday Cookbook and my Magic Cookbook. 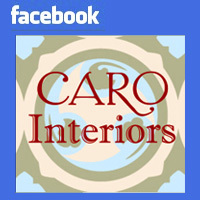 Feel free to check them out! I’m back with a progress update on my efforts to downsize my recipe hoarding collection. I’m actually really good at organizing things. Events, closets, information, home design, travel plans…but recipes, as a subject, seem to be my Achilles heel. I see potential in way too many of them and it has gotten out of hand in my kitchen. Those might not seem like huge steps forwards, but these warm seasonable evenings are when I start to really scout out new recipes to play with over the summer. Something new in cuisine type, something different in ingredients and or something more experimental in technique for me. All of these concepts lead to more recipe clipping when I find something interesting. Well, not exactly. This is what was left after I cleaned out all the pages I didn’t want. 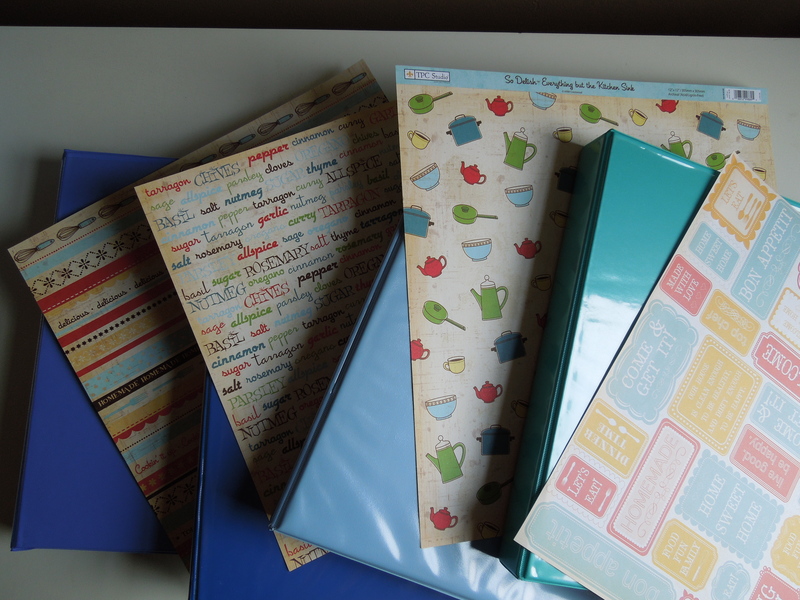 And, in fact, this does not include the “Chicken & Beef” binder that is stilled used so regularly. Let me back up. First, I pulled all of the pages out of (almost) every binder. And as I did that, I tossed or cleaned and saved-for-later-recycling all of the salvageable sheet protectors. I would hate to spend more money on sheet protectors if I can just give them good cleaning and save my pennies. That’s just how I roll. Next, I sorted out duplicates of recipes. This was a bigger problem than I expected. Apparently, there were periods of my life where I needed to own every variation of Potato & Leek Soup, Lemon Muffin, Ham Salad and Deviled Egg recipe. I know this because those recipes, among others, were noticeable themes spread across many pages within their sections of the binders. Clearly, I was thorough. 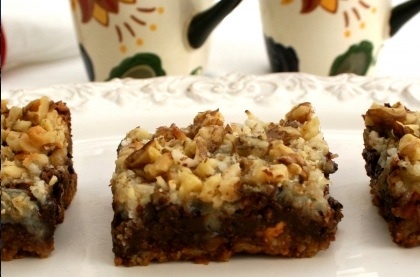 My mother always makes a similar Buckeye bar for my husband because she knows he loves them. She likes to make them as her special treat for him and I have never actually gotten the recipe from her. (This is probably better for our waistlines anyway, really. Since we only enjoy them on special occasions, they disappear quite quickly.) 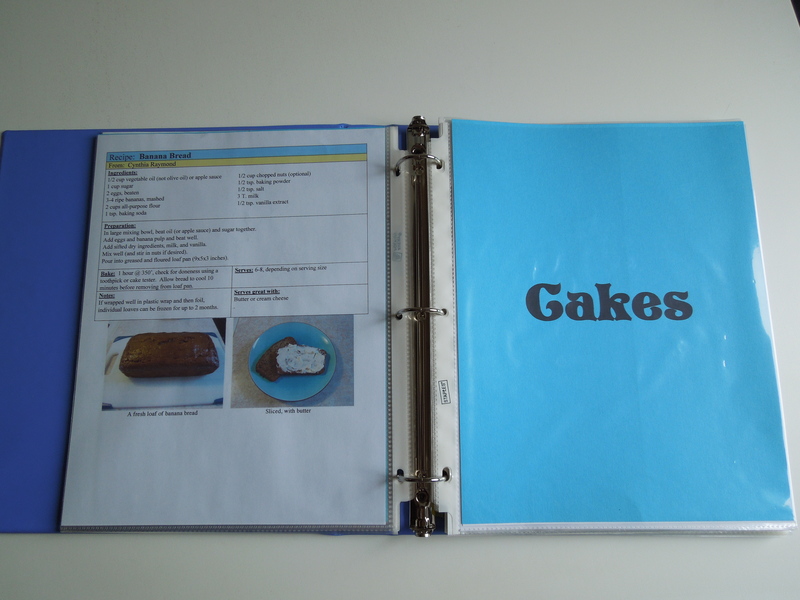 I had stumbled across this recipe that I had meant to ask Mom about and there it was, hiding 37 pages back in the binder. I kept this type of notated recipe, along with others we had made and liked, because that had been the original point of these binders. 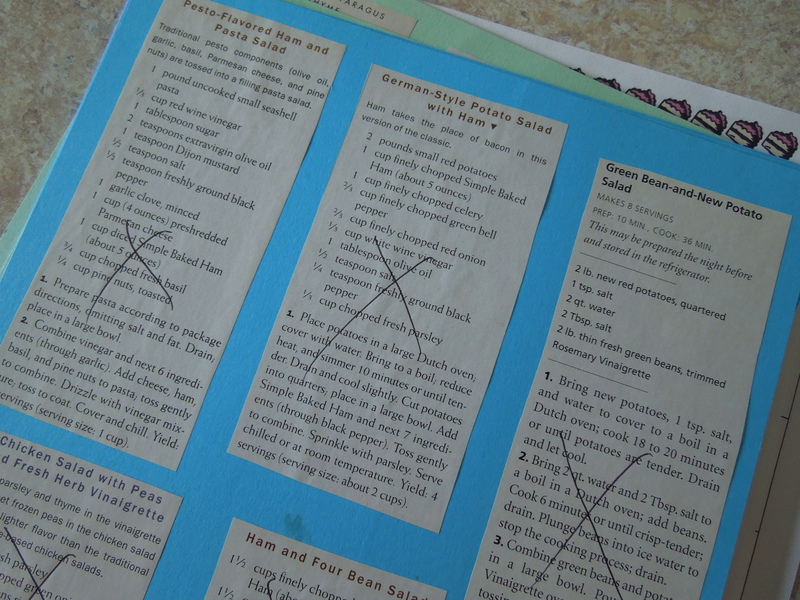 The last step of the binder page tossing was having Mr. CARO help make a ruling on the remaining recipes, which you saw in that stacked photo above. He is always an enthusiastic co-chef in the kitchen, so I was worried he would actually enable me to keep more recipes than I need. However, he was really great at browsing the ingredients and thinking about when in the year we would most likely enjoy the recipes. It was great to get a second opinion. 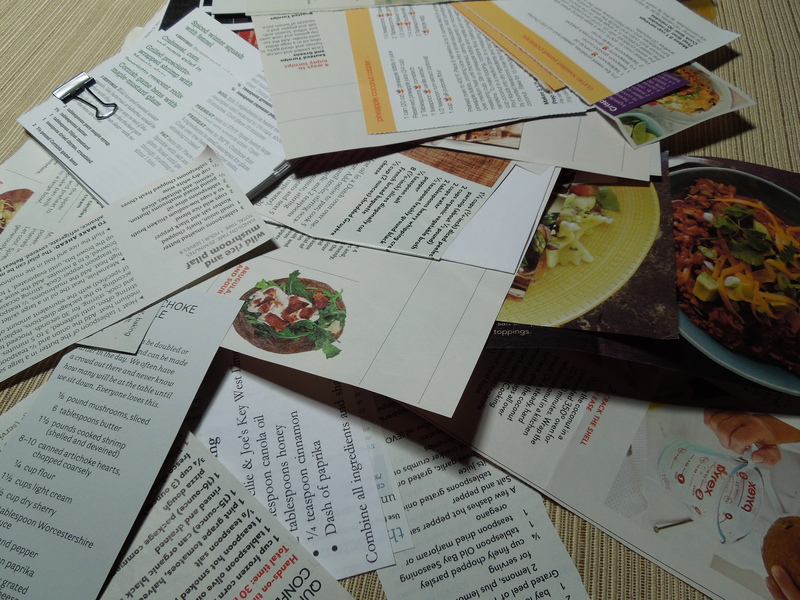 Does this sound overcomplicated to do this kind of sorting for a bunch of recipe clippings? It may be. But Mr. CARO and I love to do the grocery shopping together, because when we do, we feel like we have a better connection to what we cook together. We also make our evening meals about conversation over the table, which helps us appreciate our food, eat slower and connect more at the end of our busy days. This may not work for everyone, but we love it. The issue we did solve is how to store all the recipes we are keeping. We’re upgrading the binders concept. 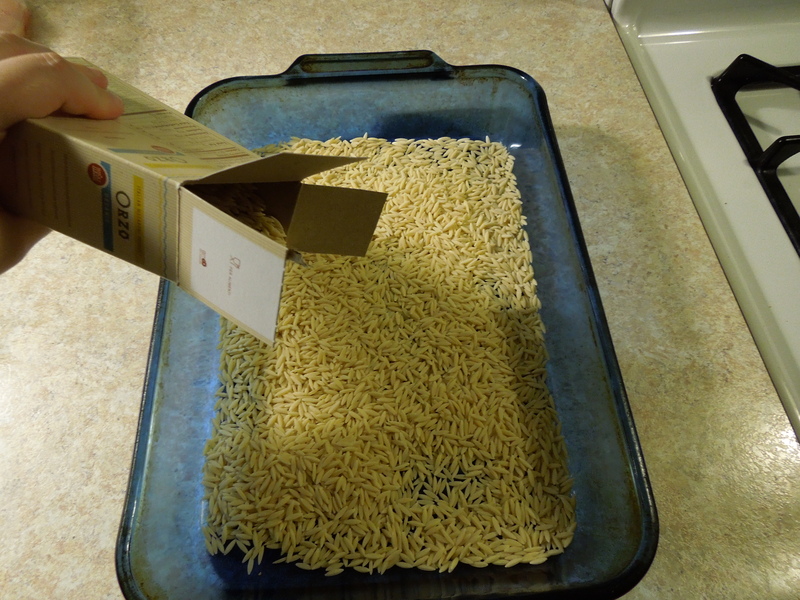 After much discussion, Mr. CARO made a great case for how easy it to use a sheet protected recipe both in the binder and clipped to the hood over our stove. He liked that he didn’t have to worry about spills and that we could add our own notes easily, as we need to. Doesn’t that look much more approachable? It feels that way to us, too. 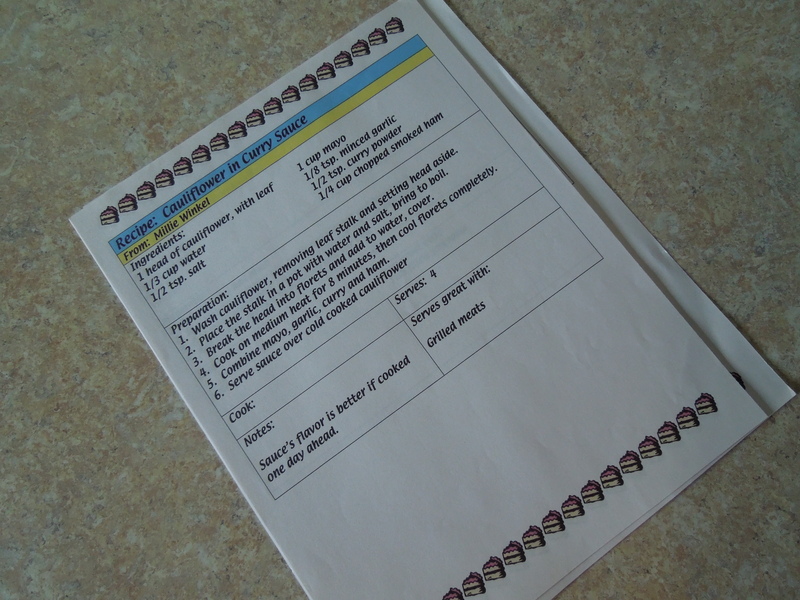 This does mean that I’ll have to type out all of my remaining recipes into this simple format. However, I don’t mind doing this, because it also make it easier to share my recipes. If you ask me for a recipe, I can just print or email you a copy. 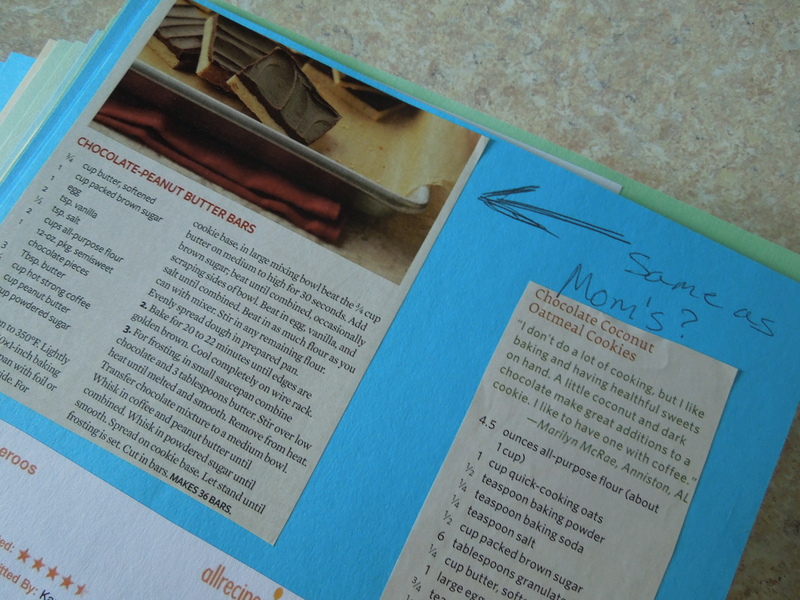 Plus, you’ll probably get a bonus recipe of whatever is printed on the page with it. I’m not under any delusions about this method. All of this typing will definitely take some time, but I can work on it over the summer, little by little. It will be so worth it when I am done. So personalized and so functional. That’s kinda the feeling I want with all of these family and favorite recipes anyway. Better to savor what you love and respect it by taking care of it. Now I’d like to hear about your recipe experiences. Does this project make you think about your own recipe system? How do you store your absolute favorite recipes? How do you share your recipes with friends? Have you ever discovered you had a stockpile of similar recipe themes? Dish with me in a comment! This is my salad spinner, at home, in my kitchen. It is the inspiration for this post. 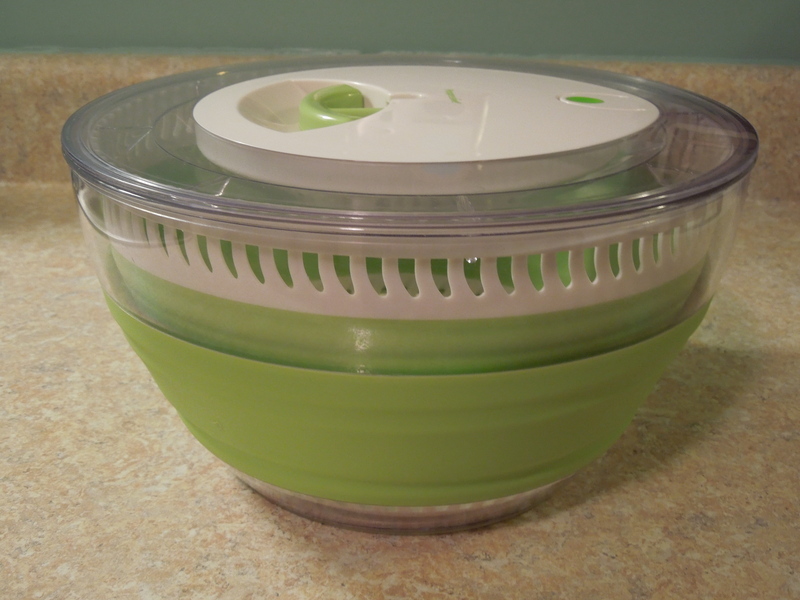 I have been meaning to write about my salad spinner for a while because it is rather popular in my house. Mr. CARO looooves using it. As in “Honey, it’s not a lawn mower. You only need to pull the string once.” (I sometimes think he is trying to get it to take off like a helicopter.) 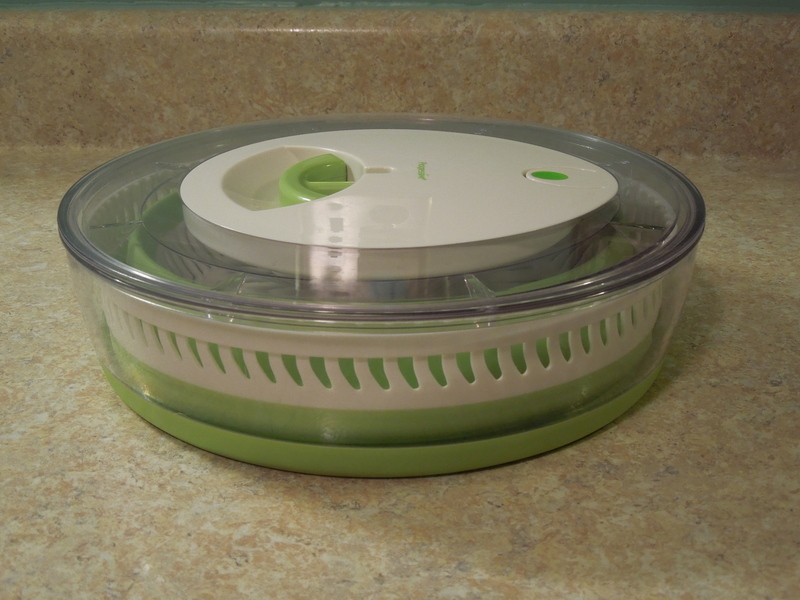 Friends and family members have asked more about this salad spinner when they have seen it in action. I have to admit, I have given several of these salad spinners away as gifts. Christmas, house-warming, weddings. It has fit as an appropriate gift for many occasions. I, myself, never wanted to own a salad spinner until I saw this one. But when I did see it. I WANTED it. I never liked salad spinners before because they were all giant, lined bowls that took up a big footprint wherever I could have put them. And it’s not like you can store a lot in them when they are put away because the lid makes it cumbersome. I love kitchen tools that work hard and store small. I have between a small and medium-sized kitchen, so I don’t have a ton of extra cabinet/pantry space in my kitchen. (Does anyone out there have “extra” kitchen cabinets?) When something can get the job done really well AND store nicely with other things, I am interested immediately. Besides my friends and family, I’ve found many clients who also appreciate a great space saver in the kitchen. Sometimes because they don’t cook much and need more cabinet space for pantry items, sometimes because they like to cook a lot and need a way to fit more tools/gadgets together in an already packed area, and sometimes because they don’t have a huge amount space to begin with, so they have to make every inch of storage count. Do you fit in any of those categories? One of my very own pots and pans drawers. Just keepin’ it real, friends. 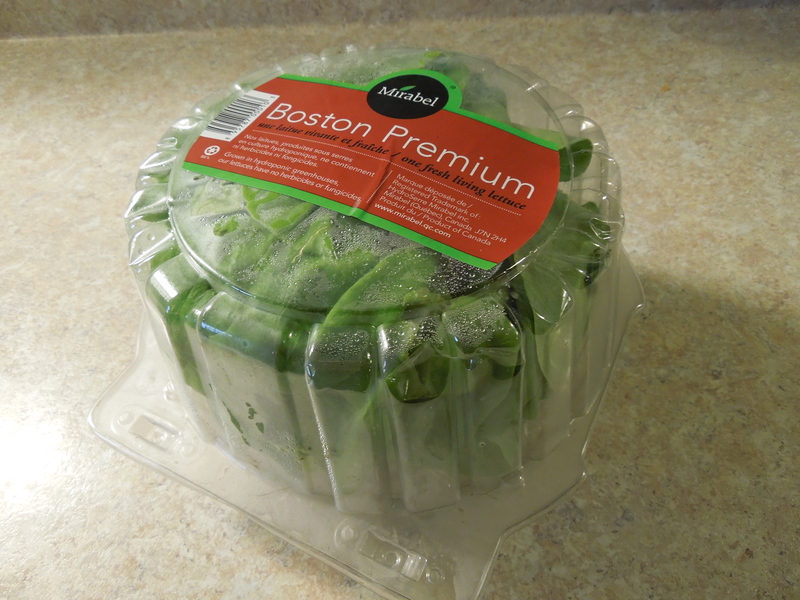 Since I love my salad spinner, I’ve payed close attention to other items I’ve seen pop up recently that offer similar storing options. 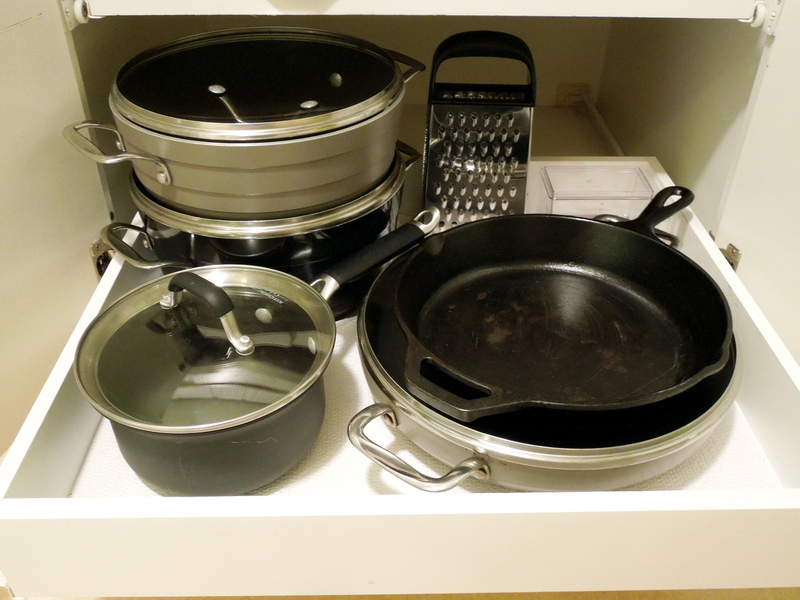 Who can’t use more storage space in their kitchens? So, today’s post is a fun list of fabulous kitchen tools that collapse down into smaller, more storage-friendly shapes. Whether you rent or own, these are practical items for real life. Oh, and I’ve linked all the pictures below directly to their shopping sources to make purchasing easy. Just in case you need one for your kitchen, or a wedding present, or a hostess gift…you get the idea. Just click on the picture to link to the item. Here we go! You knew I was going to start with this one. 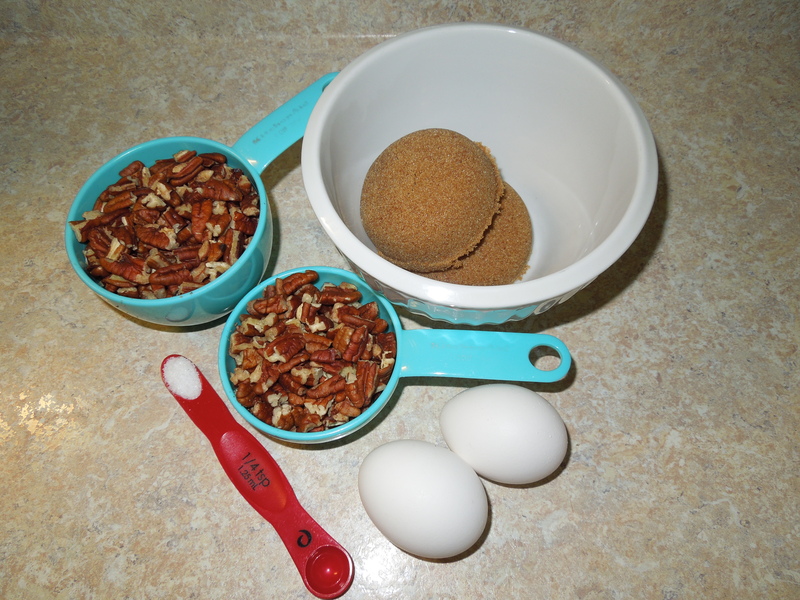 You can use the outer bowl as a nice separate serving bowl, which makes it a double-duty tool. For $23, I love the reasonable price on this spinner, too. I don’t understand why some spinner models are close to $50 for what is really a couple of plastic bowls. 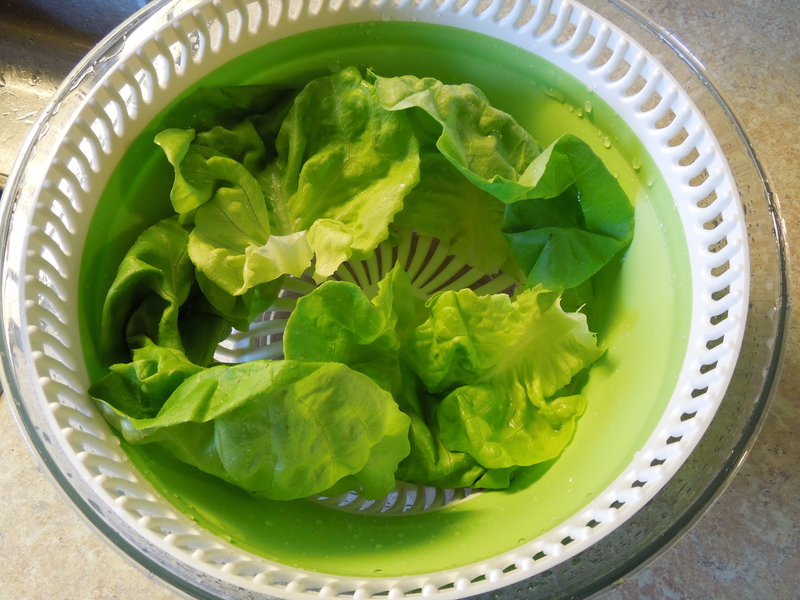 Okay, technically, you can use the interior salad spinner bowl above as a colander for fruit and veg. However, if you are going to be draining something hot, like pasta or boiled potatoes, I always chose metal surfaces over plastic. 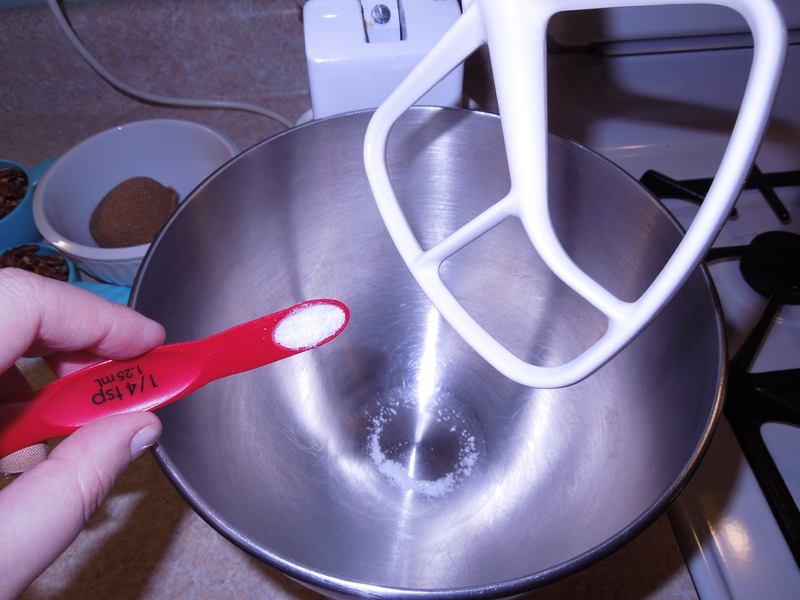 The silicone in this bowl, (like most silicone tools) can withstand temps up to 500 degrees. This little baby also comes in a variety of fun colors to choose from, several different sizes and features a handy metal loop for those of you who like to hang your pots and pans. This is the thing you stack lots of sheets of cookies on when you are prepping them to bake or taking them out of the oven to cool. This thing is perfect for kitchens with next to zero counter space. (Any NYC peeps reading this post? I got your back.) The rack folds so flat you can slid it into storage like a tray. 20 bucks. Genius. FYI: If these storage carriers cause you to bake more sweets in your kitchen, I am NOT responsible. I have a similar disclaimer on my Brownie Pie recipe for a good reason. Don’t send me emails about needing to buy larger jeans. I’m probably already at the store trying on new pairs, myself. Every kitchen has some items that won’t go in the dishwasher. If your kitchen doesn’t have a dishwasher, or at least a non-human one, you may love this item even more. At only $20, this dish drainer can even adjust to fit over different-sized sinks. I like that it includes a silverware divider and can be collapsed small enough to run it through your dishwasher when you need to…uh, again, the non-human kind of dishwasher. This 3 quart mixing bowl is by the same company that makes the salad spinner and the dish drainer above. Clearly, they have built upon a great product line. They also carry a large collapsible tub and a nice set of 3 prep bowls that include lids. Amazon has a deal where you can buy all three for items as a set for $40. I’ll admit it. I’m not a huge fan of box graters. I love eating cheese, but I am not fond of working so hard to shave a big block of it down. 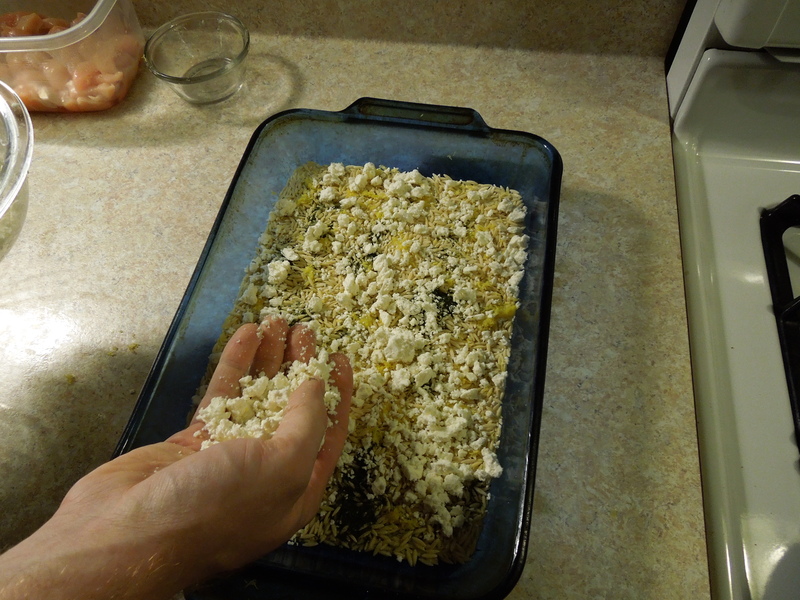 Mr. CARO is the cheese-grating czar at our house and he has the manly biceps to prove it. However, this foldable option looks much less intimidating to me. And I know it exactly where it would fit better in our cabinets, rather than the one we have now that always seems to be right in my way every time I’m looking for something else. No more trying to nest all those little spoons and cups in the right order in the drawer! Just toss them all in there and let the lay flat. Wish I had thought of this idea and gotten the patent. At this rate, if you go get all of the items on this list, you may actually end up with an “extra” kitchen cabinet. Okay, this item doesn’t collapse, per se, but it is worth mentioning for its savvy design. It would make a great wedding or bridal shower gift. It allows you to store an included set of cookie cutters within the pin itself. For more experienced bakers, you can fill the pin with ice cubes to keep your dough from getting to warm while you’re rolling it out. So smart. I saw this little beauty advertised in Real Simple magazine last month and had to include it. It stands at 20 inches tall when assembled. All seven of these separate tiers stack down into the base for storage. How great is this for easy entertaining in your home? I may have to put this on my list for Santa this year, then I can serve him cookies on it next Christmas Eve. So, that is my long-ish list of what I’ve found out there. Pardon me for being a tiny bit ramble-y in this post, but when I find a great organizational solution (or 15), I like to share it. Now I want to hear from you. What kitchen tool still needs to be re-created in a collapsible form? Can you think of something? Is there an item that I missed out there on the market when I made up the list for this post? What is the most awkward kitchen tool you wrangle onto a shelf or into a drawer? At least leave a comment so I know I’m not the only one out here with overflowing kitchen shelves. Dish with me! They say admitting you have a problem is the first step toward solving it. However, in my experience, with this particular issue, it just means you find more shelving to load up. I have way too many cookbooks and recipes. WAY. TOO. MANY. This is just one small handful that I grabbed for a picture. To also give credit where credit is due, my husband (Mr. CARO) now loves to cook, too. I did not find him this way when we started dating. He did cook for himself, which was refreshing to find in a guy, but it was mainly salads and what I call the classic “Bachelor Boil”. Boil pasta, boil sauce, boil soup, boil eggs… (Ladies, can I get a witness?) However, the man was game to try new any recipe and what more can you ask for in a recipe enabler partner? Mr. CARO is an excellent cook. So, when we got married I started collecting recipes in a much more purposeful way. 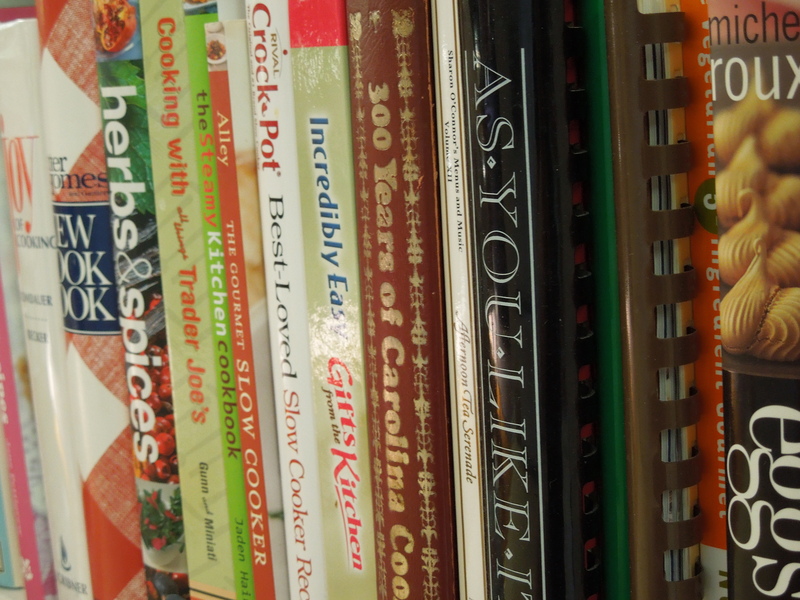 I scanned magazines, I searched online, I actually read many of the older cookbooks my mom had offloaded onto me in an effort to diminish her own recipe stockpiling tendencies. (See, nature and nurture. This really isn’t my fault.) 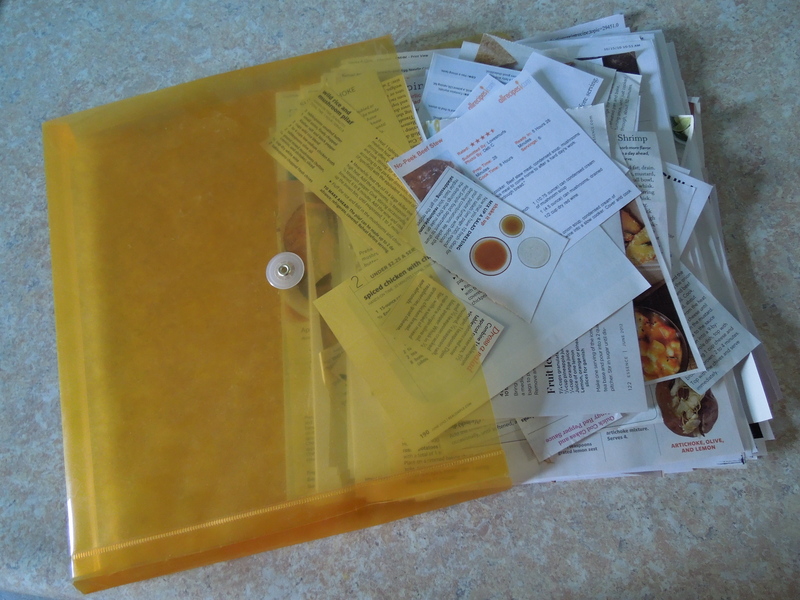 As I collected , clipped and printed recipes that sounded good, I decided to paste them all onto card stock and put them in sheet protectors, in three-ring binders. Sounds logical and organized, right? I was very efficient at this. In five years, I had 8 full 2-inch binders. EIGHT. Soooo much time spent gluing. These binders were so full I had to dig every time I wanted to find a recipe that A) we had already tried and B) that we liked. This was my recipe for a What’s-for-dinner nightmare. So I stopped gluing, because clearly the binders weren’t working so well and I didn’t want to spend more money on more of them when I didn’t have the shelf space for them either. Go ahead, judge these books by their covers. 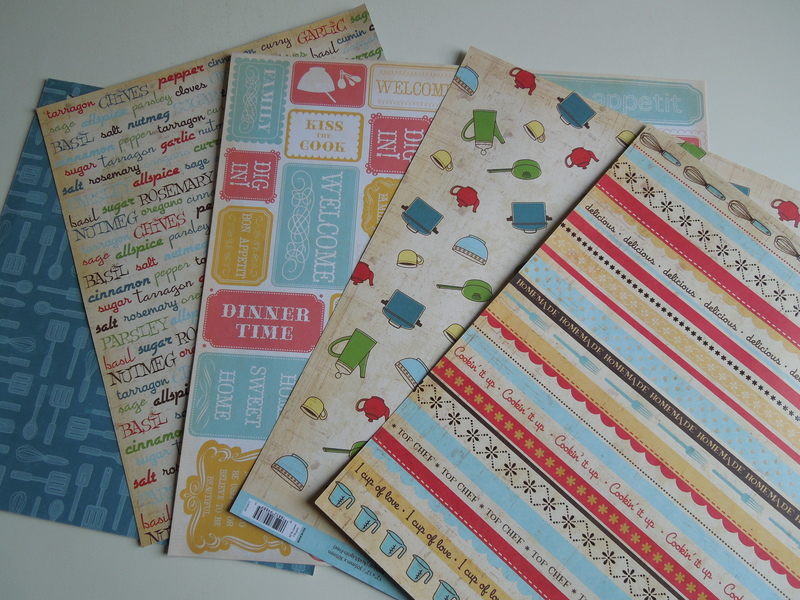 So that’s where the idea for this post series came from…paper hoarding in my kitchen. Is this problem solved? Noooooooo. But I’m working on it and have found some real solutions. I thought I would document my progress since I realized that this is a more common problem than I had originally thought. I also thought that by documenting my progress on the blog I could publicly shame myself into staying on task. (Bonus!) I’ll be blogging this project in real-time, so I can keep my solutions honest. Note to self: These tools are not my friends in the kitchen. The one thing that I can tell you I have done so far is donate a whole bunch of the really old cookbooks that my mom and I never used to my local library. I’m still not sure if this was a good deal for the library, but they took the books anyway. If you happen to find yourself in the Main branch of the Enoch Pratt Free Library in Baltimore, there are several shelves in the cookbook section that warrant some sort of “donated by” plaque with my name on it. And if you are seeking complicated ways to display 1960’s tuna casseroles or 1920’s ingredients you would never bring in your house let alone eat, it may be your lucky day! An old cookbook from my great grandmother. And yes, that says “Opossum”. There is much more to this saga and I’ll share more with you on my progress next week. In the meantime, how do you store recipes in your kitchen? 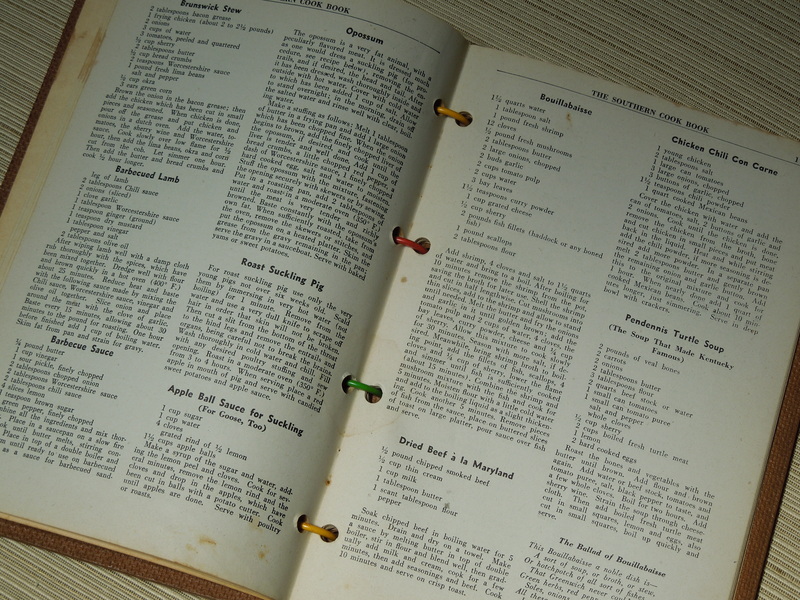 Do you keep old cookbooks that you may never use? Have you ever lost a favorite recipe? Don’t leave me hanging out here, friends! Share your stories! This recipe comes to us from a Virginia military wife that knew all about doing the familiar “bag drag” to a new station. (That’s “baggage dragging”, part of military moving slang, for all of you civilians out there.) In fact, this military wife would load up wagons full of produce from her farm and haul it all to her husband’s winter encampment to help feed the troops. 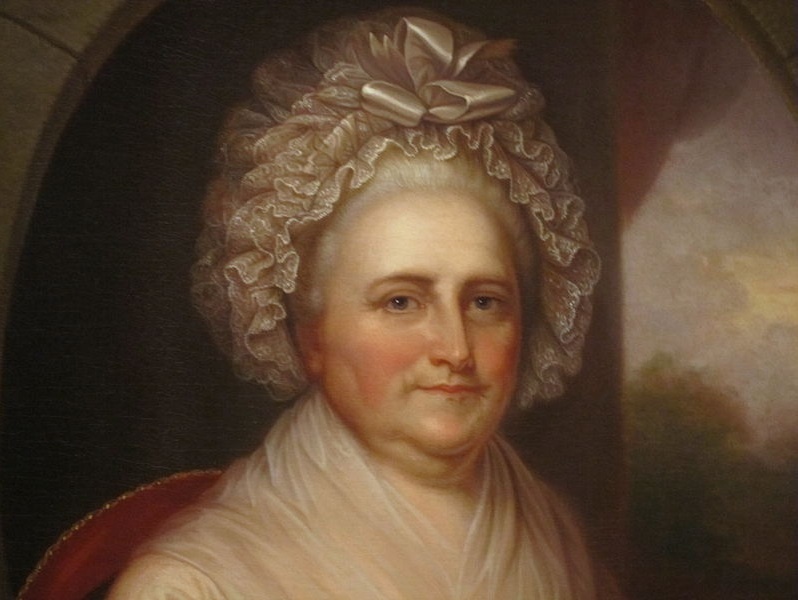 That military encampment was Valley Forge and that military wife was named Martha Dandridge Custis Washington. Now, to be perfectly honest, I can’t say that Martha actually made these cookies herself. As we all know, Martha was a very wealthy woman with many slaves and servants. She may have never set foot in her own Mt. Vernon kitchen for all we know. 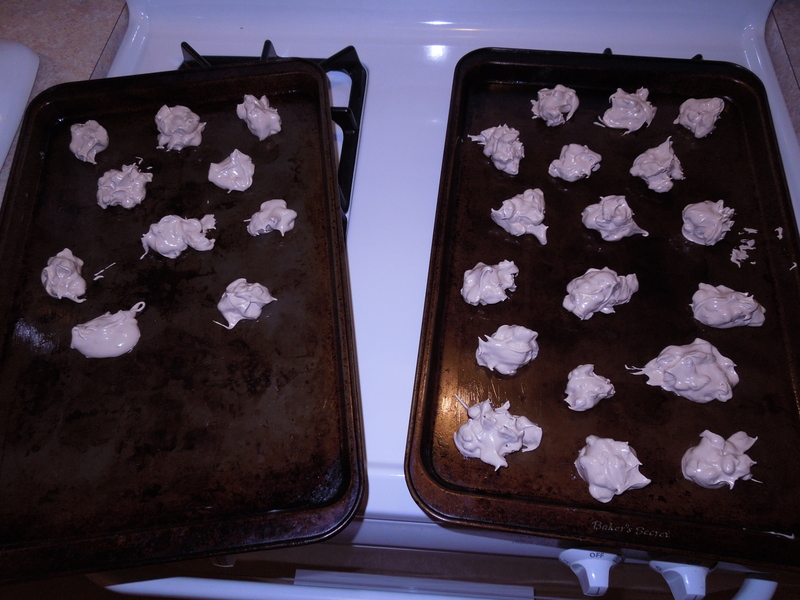 However, this meringue cookie recipe has been called “Martha Washington Cookies” for generations in Virginia. Given the simplicity of the ingredients list, it would certainly serve a military wife well when she had to entertain on the move. Pre-heat your oven to 250 degrees F/120 degrees C/ Gas Mark 1/2. We are going to bake these cookies low and slow. Grease 2 cookie sheets (I use butter) and set them aside. Next, crack and separate your egg whites. 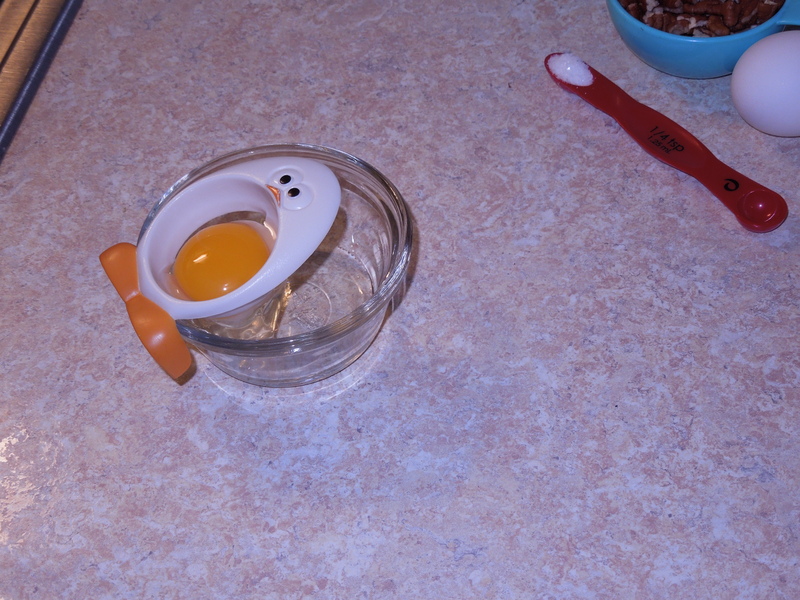 I use this dinky little egg separater whenever I am low on eggs or patience, because I am not so adept at using the shells to get the yolks out. 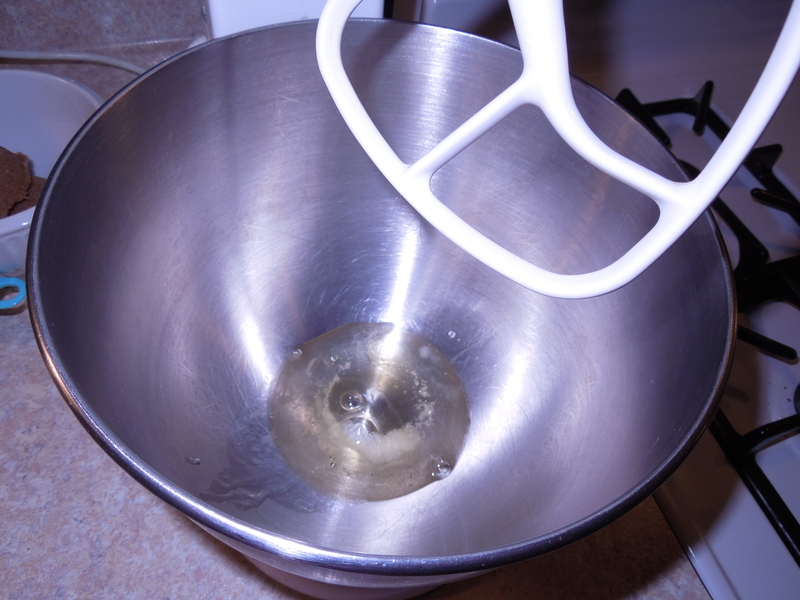 …and now beat the egg white and salt mix on a low setting of your stand mixer (or hand mixer, for those of you who are old school) until this little mix is foamy. When I first taught Mr. CARO (my husband) how to make this recipe, the word “foamy” caused some worry. “How will I know when it’s ‘foamy’? Is there a time measurement or something?” So, I will tell you what I told him, just in case you are thinking the same thing. Now that we have successfully reached foamy, we are going to add in our sugar. 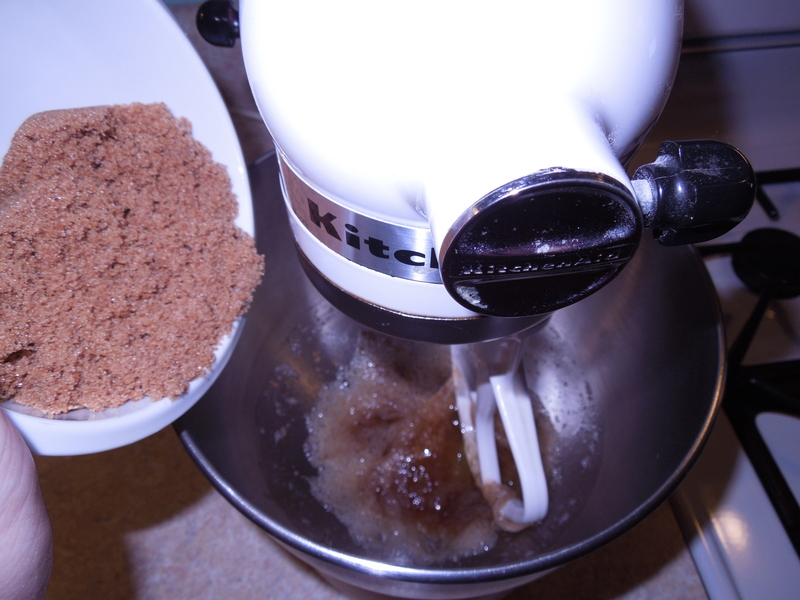 Before I add in the brown sugar, I like to break it up from its measuring shape into something that pours easier. I just use a fork to crumble it well. 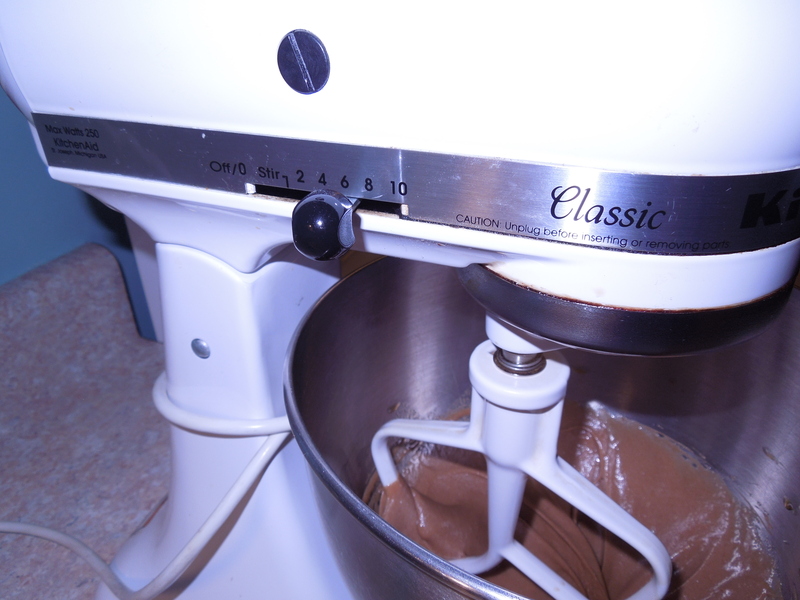 Turning your mixer back onto a low setting, slowly add your sugar to the egg mix. 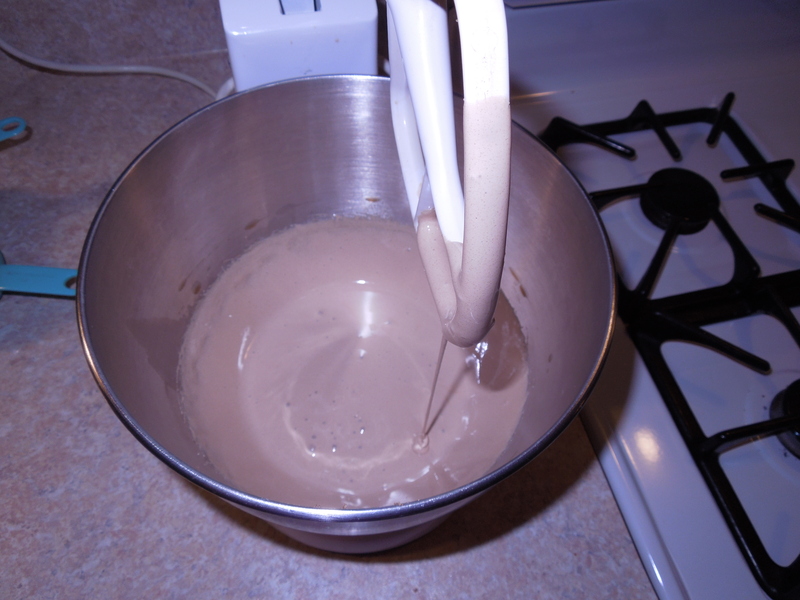 This is your basic batter, but now we are going to put chemistry to work for us to triple the quantity of the batter. By folding in air as the batter is rapidly beaten, the egg proteins will stretch. 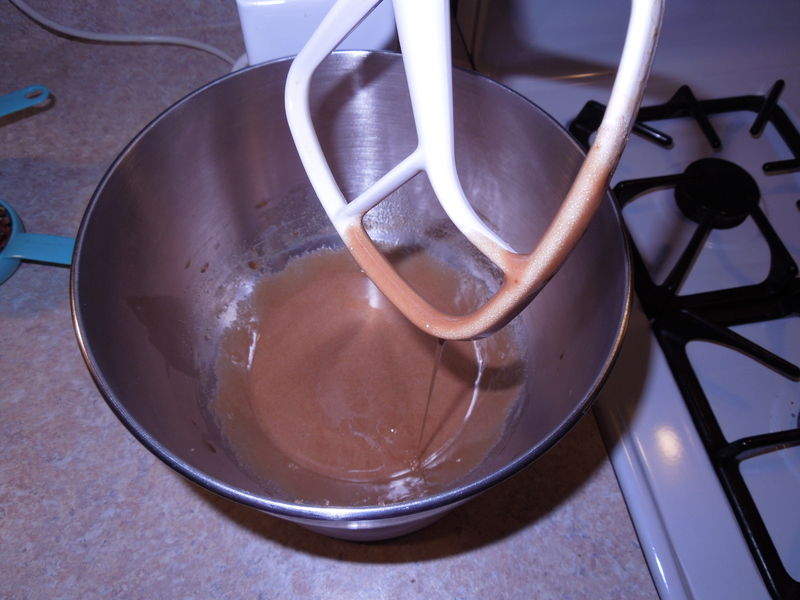 The sugar and salt help the batter hold the air in the mix, making it lighter and fluffier. …and beat the mix for about 10 minutes. It’s already much lighter in color. Just keep it going until you reach 10 minutes. While we’re waiting, I’d like to take a moment to salute all the hardworking American women who have ever hauled electric American kitchen appliances to foreign locations and voltage requirements. May your adapters run forever smoothly and your warranties be ever sound, ladies! 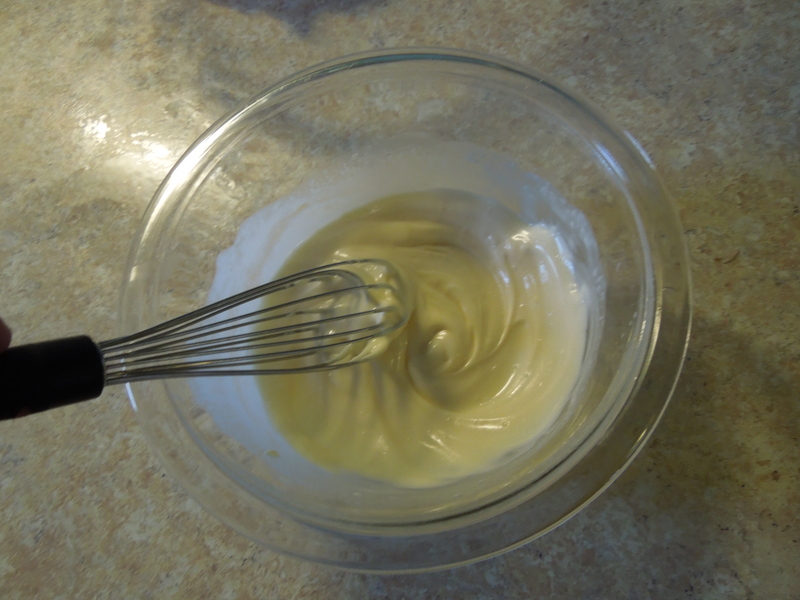 This peak of batter is holding still, with a stiff point, not dripping back into the bowl. 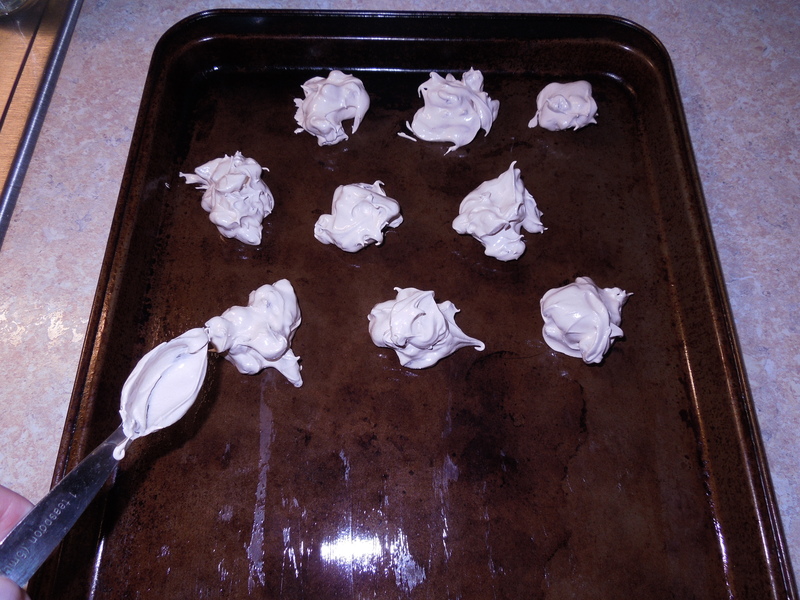 This is how you know the meringue will hold up in the oven. 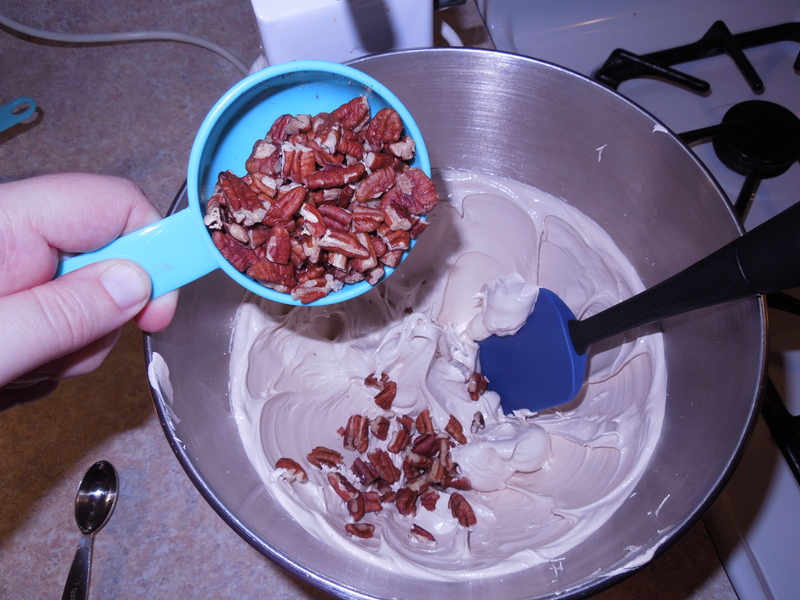 Now gently fold in the pecans. You want to make sure that you fold in the nuts and not stir them into the batter. 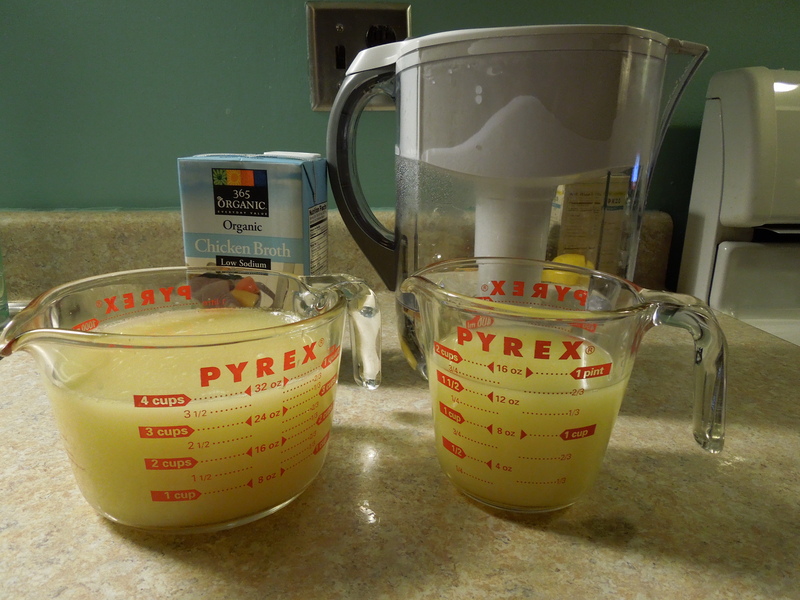 If you stir the batter, the motion will break up all those nicely stretched egg proteins, essentially undoing all ten minutes of your mixing. 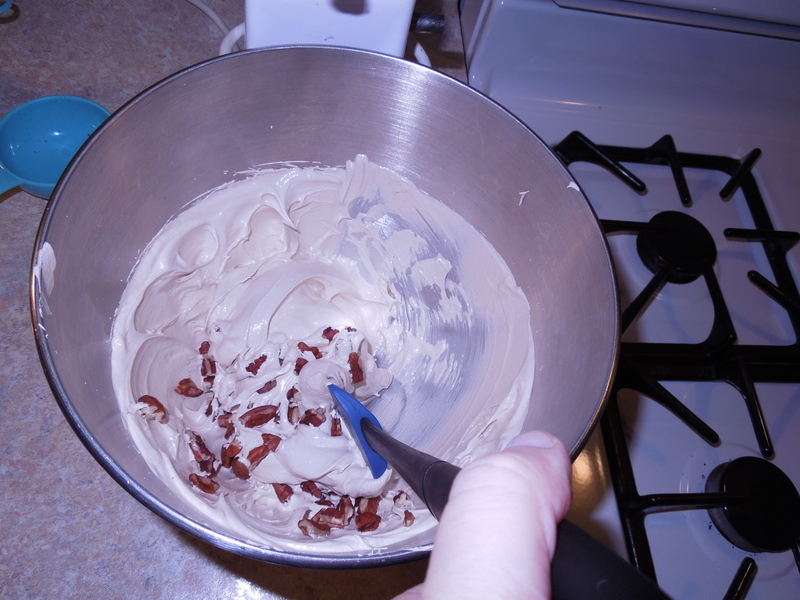 …then fold some batter over the top of the nuts. 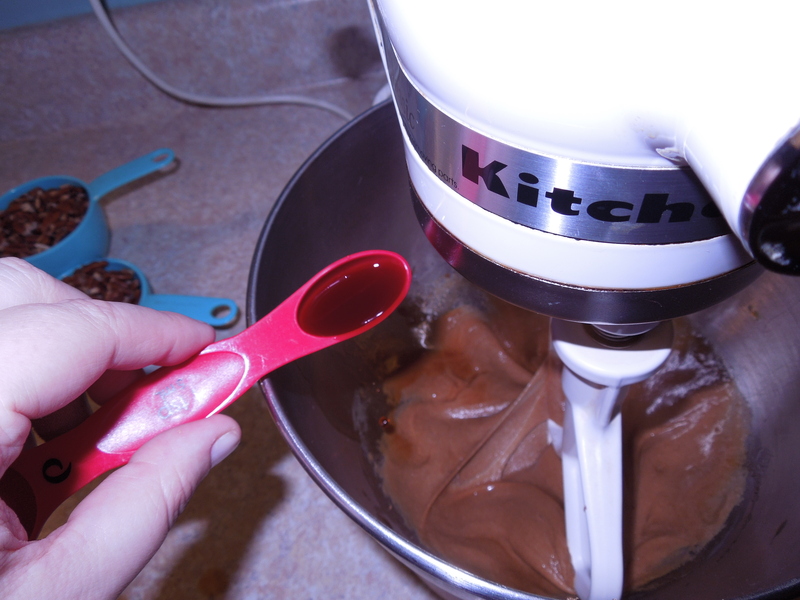 Repeat this step until you have all the nuts folded into the batter. 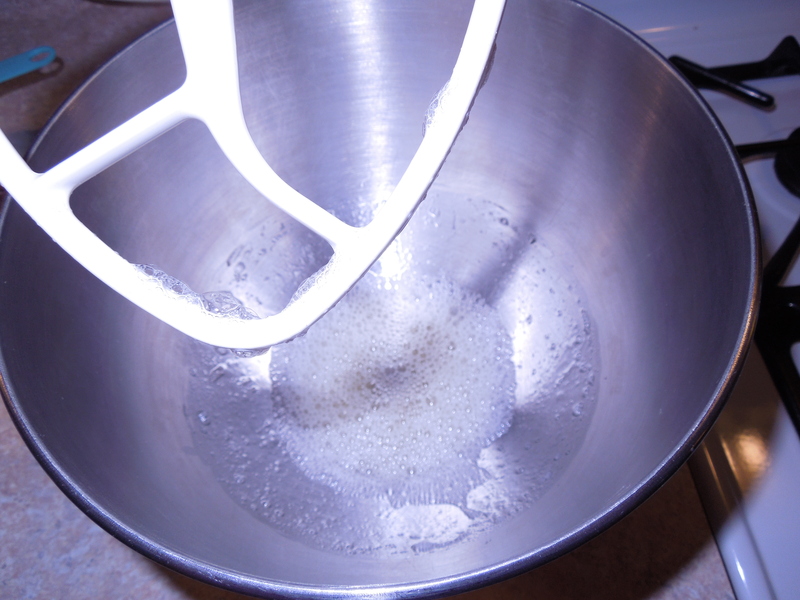 As soon as your batter is complete, use a teaspoon to scoop and drop the batter onto your greased cookie sheets. These cookies do not spread or rise when you bake them, so you can dollop them onto the baking sheet rather close to each other. If I had used an even teaspoon measurement, I would have an even two cookie sheets full of cookies. 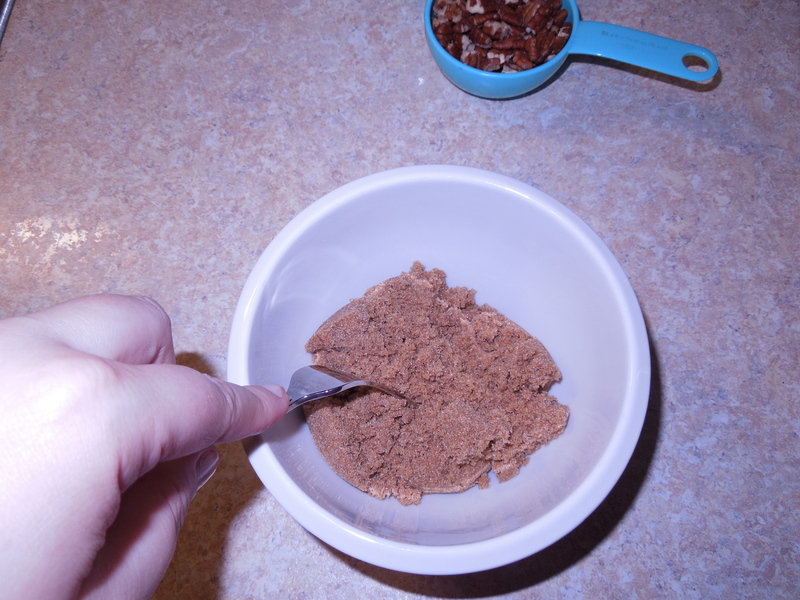 However, Mr. CARO likes these cookies a little larger, so my cookies are closer to a large Tablespoon size. 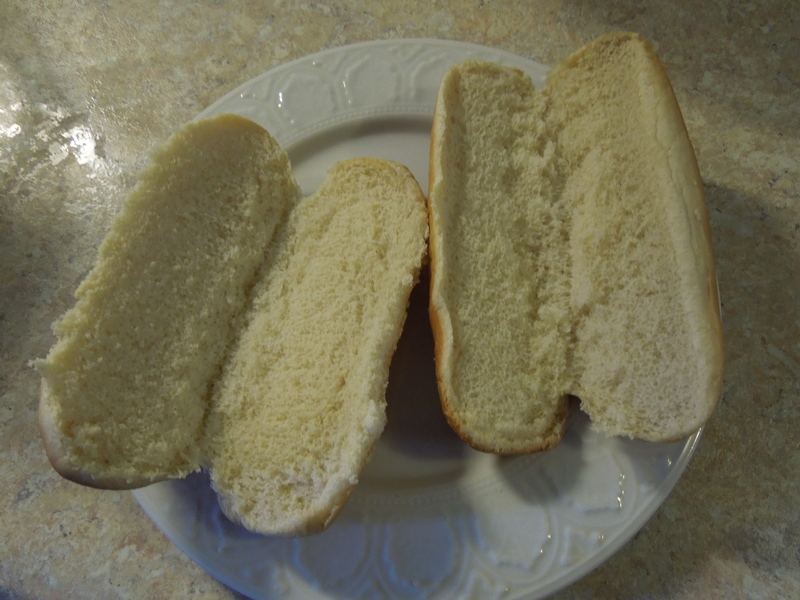 I wouldn’t go much larger than that, though, or they won’t bake through evenly. 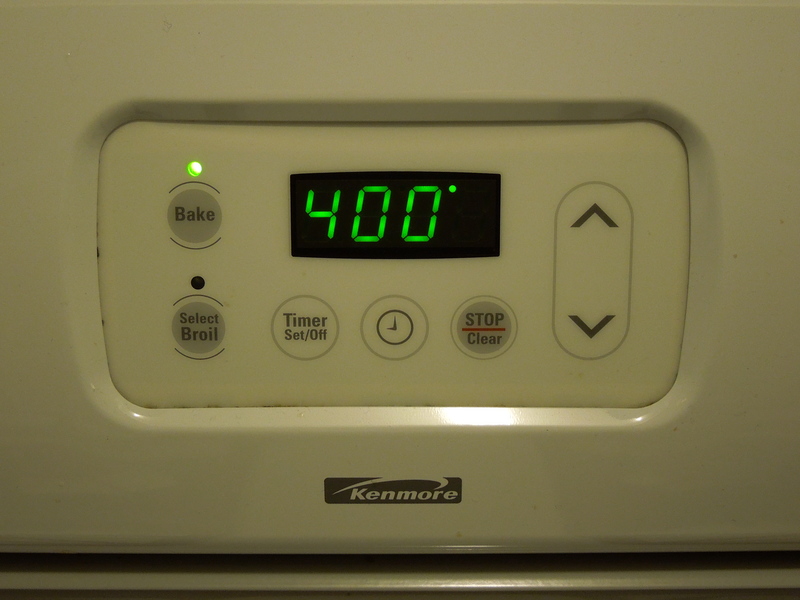 When your cookie sheets are ready, pop them both in the oven on two separate racks and set your timer for 30 minutes. When your timer goes off, rotate the sheets 180 degrees and swap their placement on the oven racks. Reset your timer for another 30 minutes. 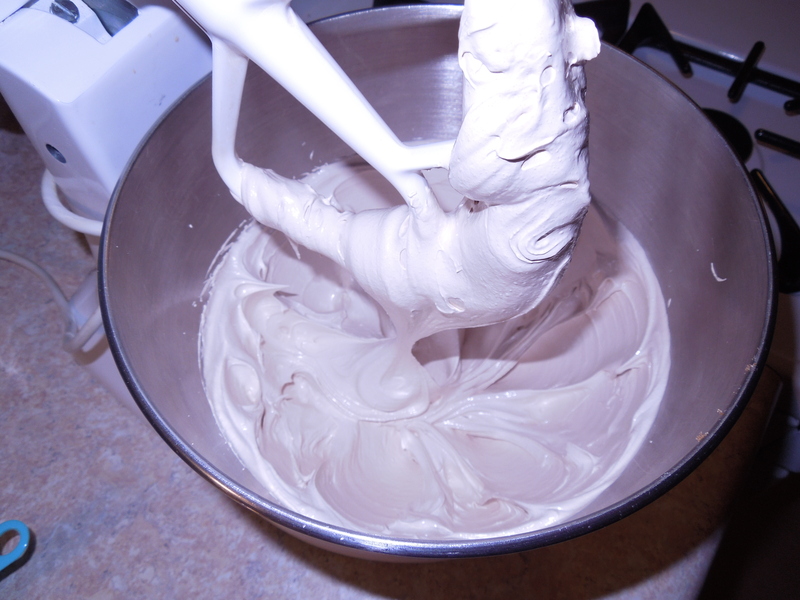 Important Note: You can’t store meringue batter in the fridge or on the counter. The stretched egg proteins will not hold their shape for long before baking, so you should make just what you can use right away. This recipe is difficult to double because it bakes for a full hour and the batter won’t wait. 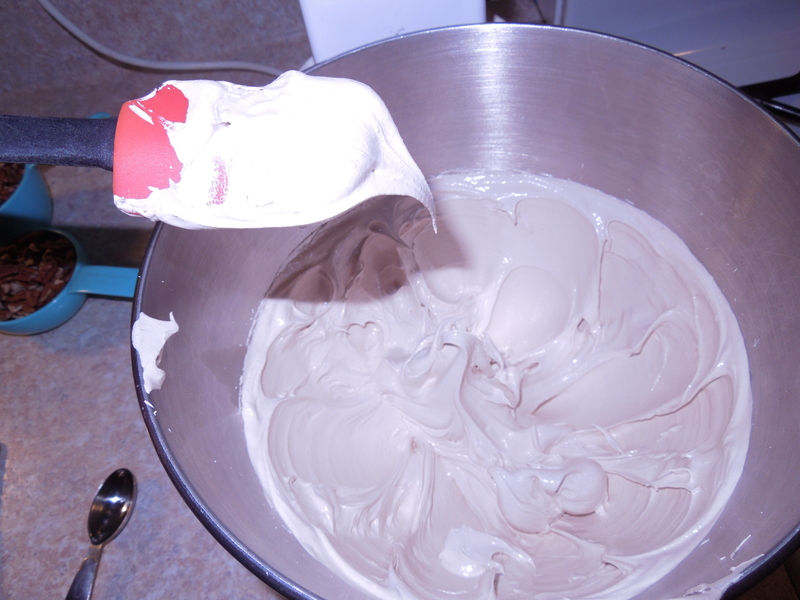 However, if you are lucky enough to have double ovens, meringue away! They are only slightly more golden and glossy then when they went in the oven, but if you look closely, you’ll see slight cracks in the sides of the cookies. They come off of the baking sheet very easily. You can even remove them with you fingers. And don’t they look pretty on a plate? So what do you think? Do these flavors sound good to you? 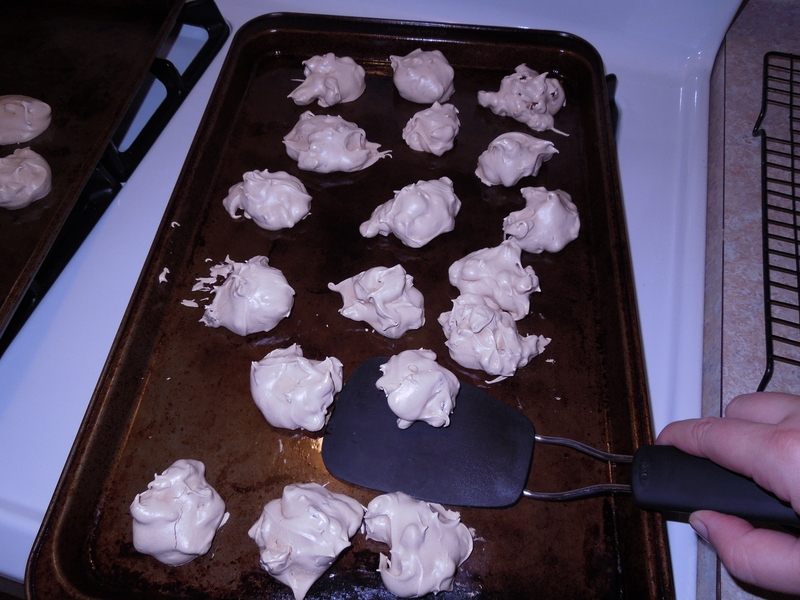 Does this easy recipe inspire you to try a meringue cookie? What other recipe techniques are you wanting to try? 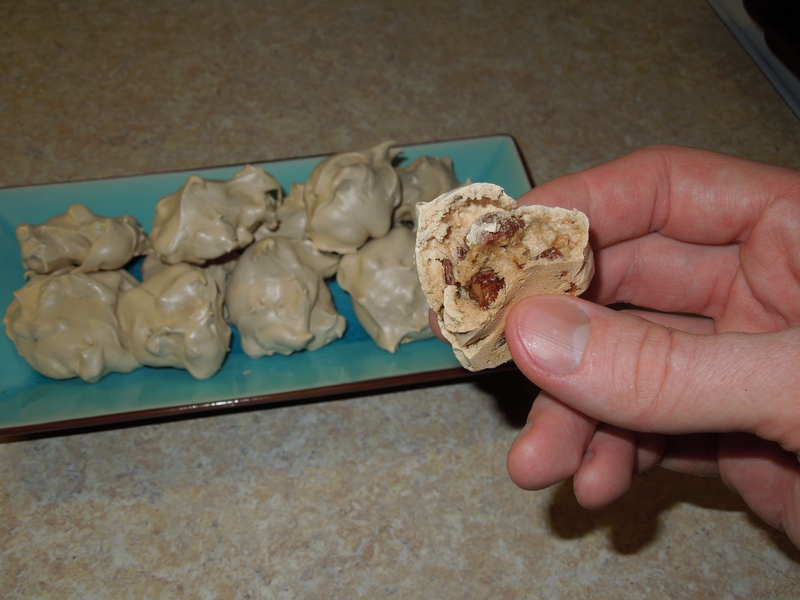 Leave a comment, especially if you try this recipe, and share your thoughts! And most importantly, if you happen to know a military wife, be sure to thank her for HER service to our country! It is just starting to feel like Winter here. Coats are now mandatory when we go outside and we no longer question, “Do we really need the heat on today?”. Cold weather, mostly grey skies and early sunsets make us crave some comfort food at the end of the workday. This is a great recipe for young children to help out with, because once you get past the ingredient prep, it is mainly variations of pouring. 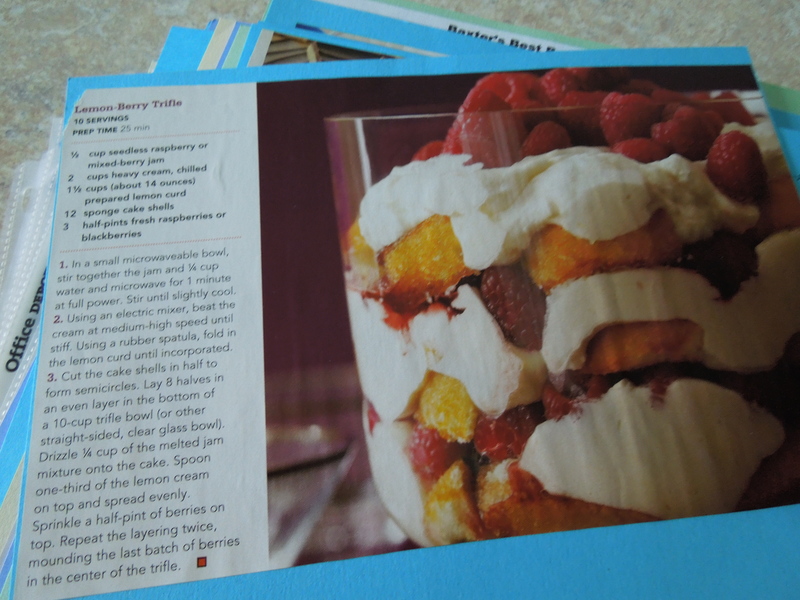 Like many of my recipes, this one has its origins in a magazine clipping from years ago. I’ve fiddled with the ingredients to make it ours and you can, too. Pre-heat your oven to 400°F /200° C /Gas mark 6. 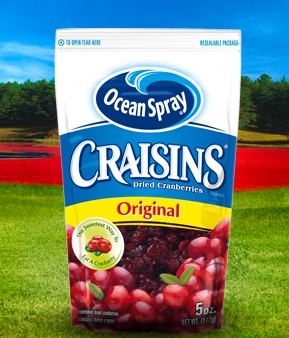 …place them into a large pot and bring them to a slow boil. If the pot boils before you need this ingredient, later in the recipe, just lower the temperature and keep the liquid simmering on the heat. Gather the rest of your ingredients together so we can use then in quick succession to layer our casserole. 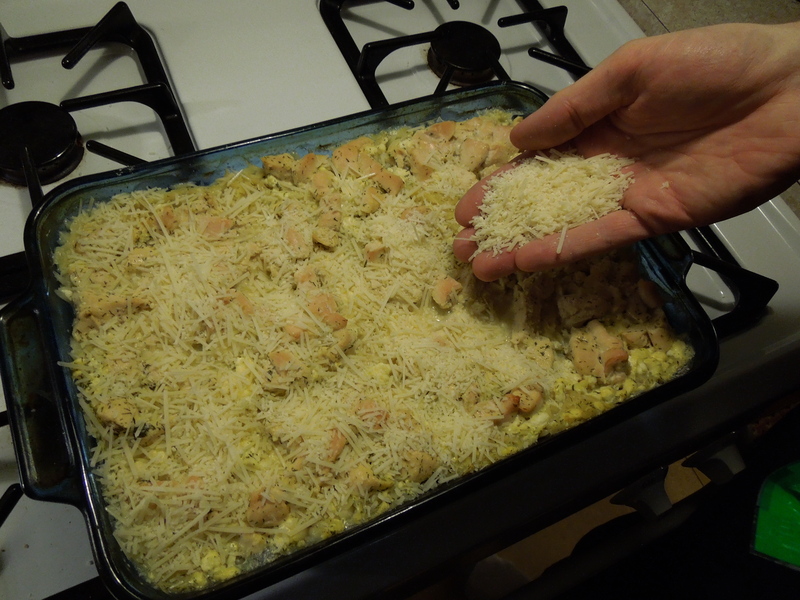 Using a large baking dish (I’m using a 13 inch x 9 inch glass baking dish), pour all of the orzo (uncooked) into the dish. 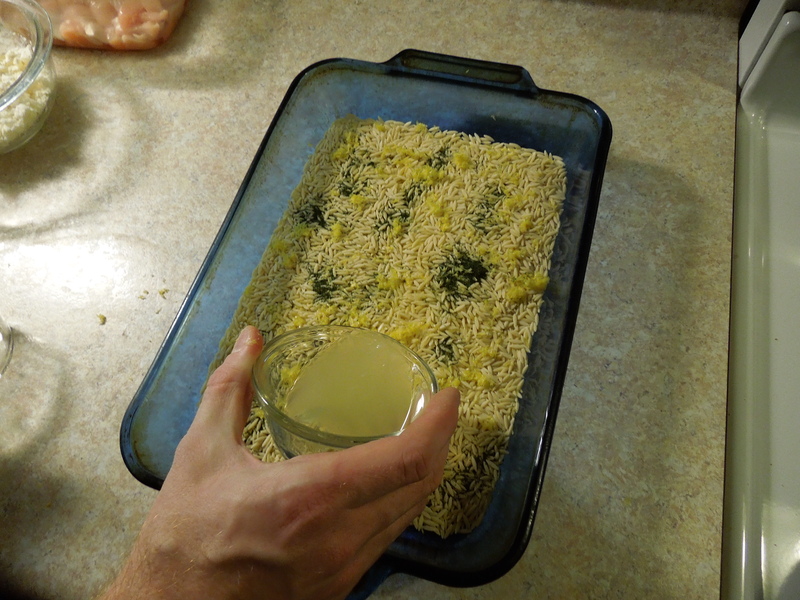 Next layer in dill, sprinkling it somewhat evenly across the dish. It doesn’t need to be perfect, because the stock is going to move everything around when we add it in a few steps. 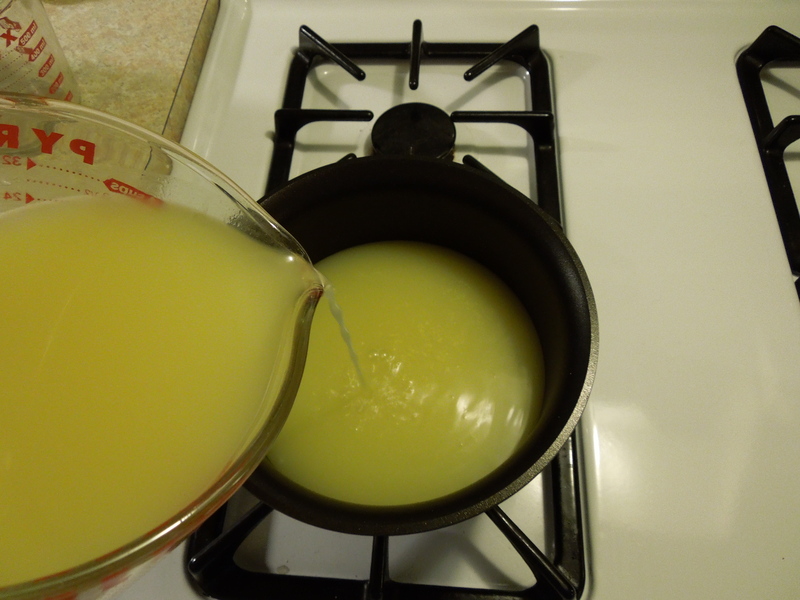 Next, layer in the lemon zest and the lemon juice. Again, spread it around, but don’t worry if it is not completely even. 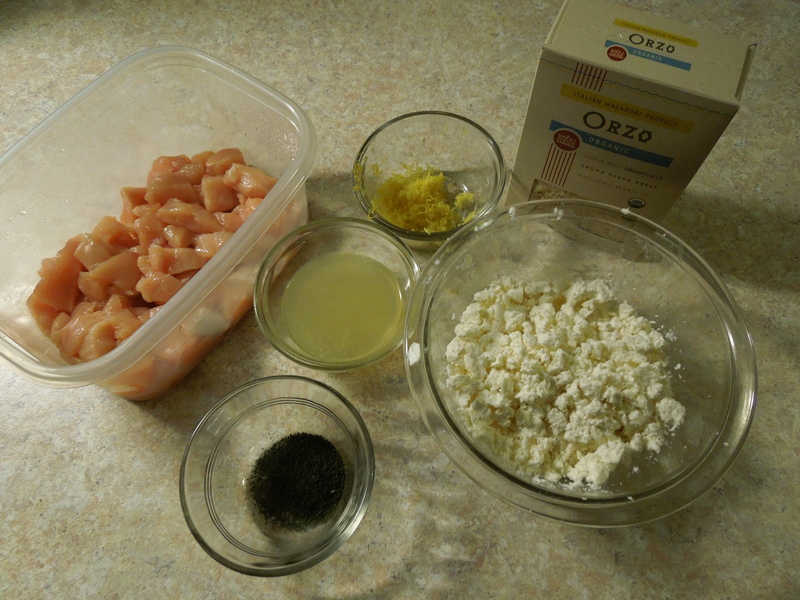 …and follow it with the layer of raw chicken pieces. Now comes the stock that has been gently boiling, simmering on the stove. 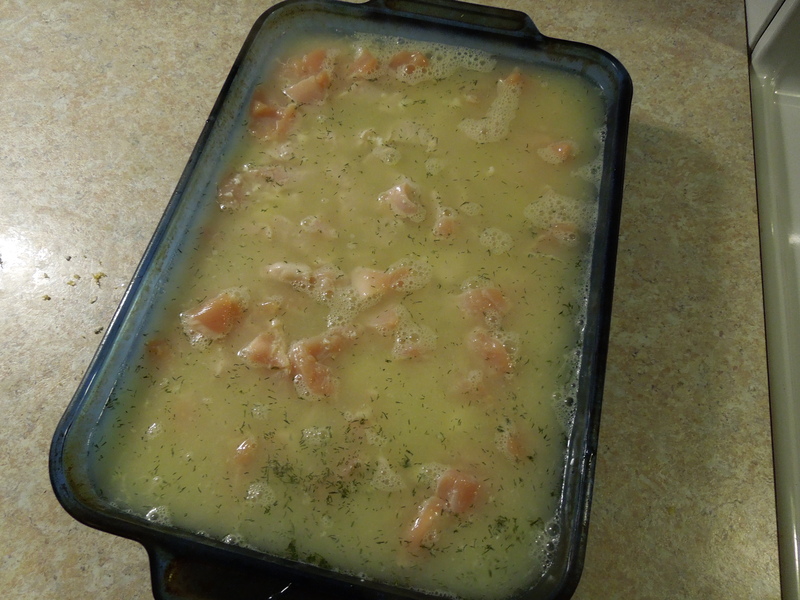 Carefully, slowly pour the entire pot of stock into the baking dish. 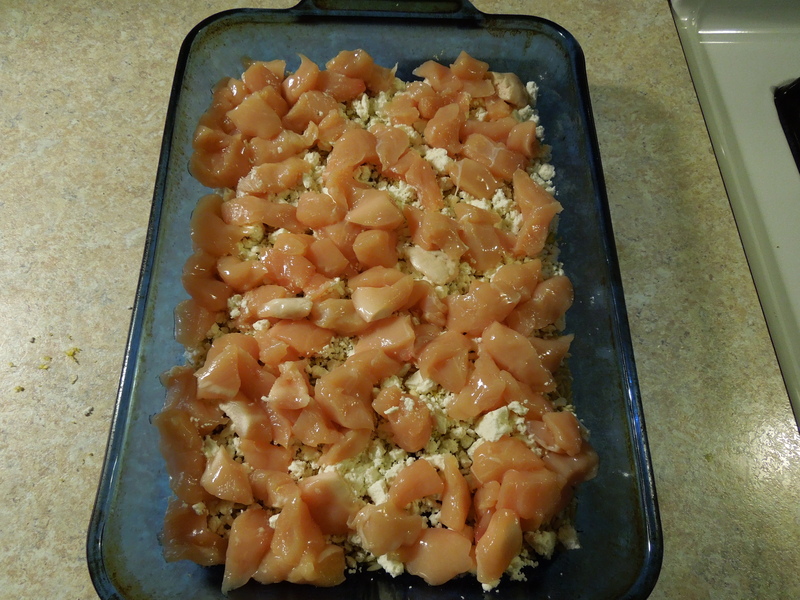 …and it’s ready for the oven. Bake it for 40 minutes, without any foil or cover on the dish. We love the creaminess of this recipe, the savory of the dill chicken and the unexpected taste of lemon. We serve this with a simple green salad, using what ever we have in the fridge, for a simple but satisfying supper. 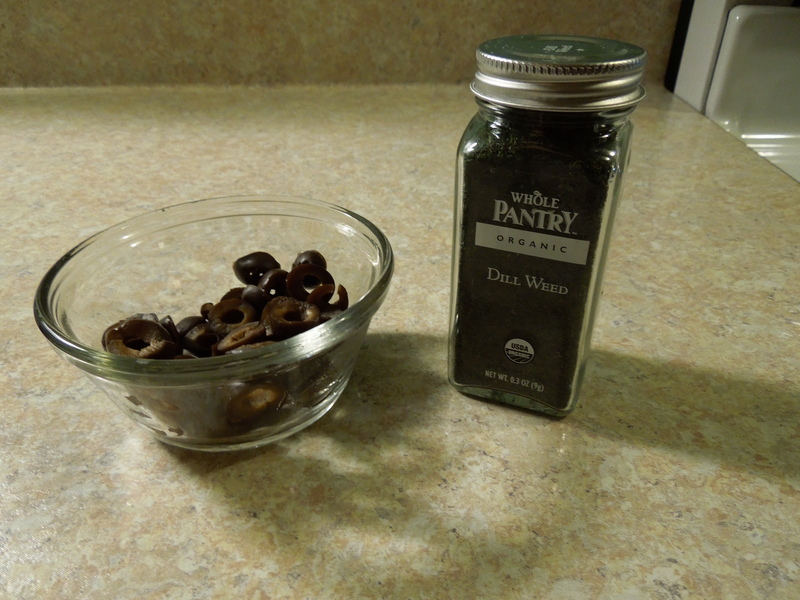 One of the great ways to make this dish your own is to play around with the olives and dill. 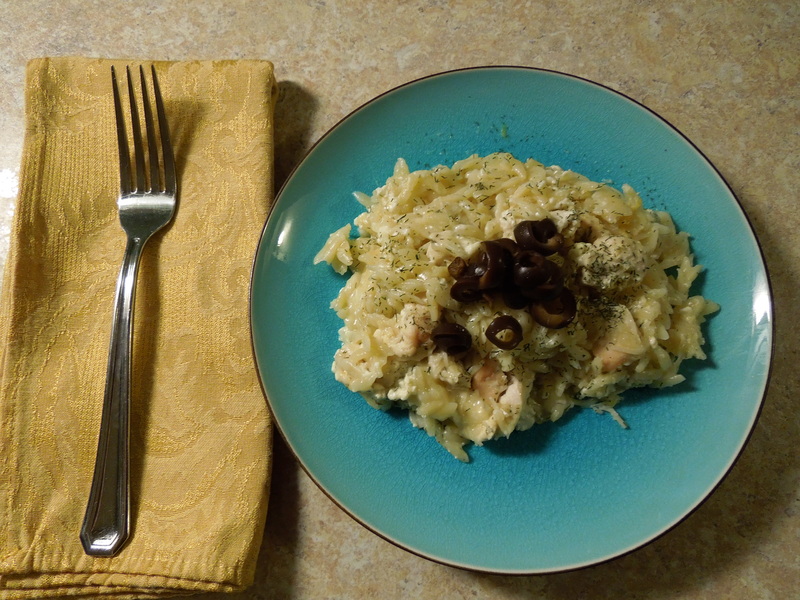 I have made versions of this with more olives baked inside, but we thought the olives stole away the nice bite of the lemon. 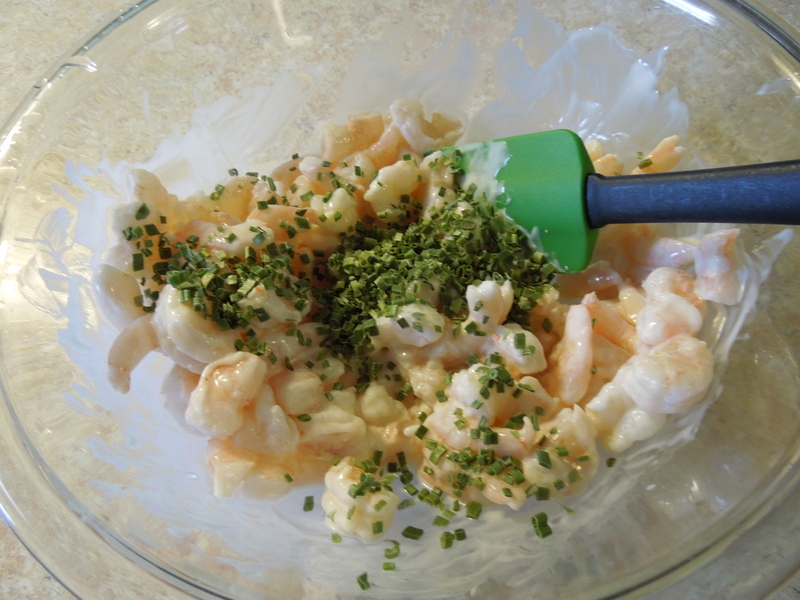 Similarly, we have played with the dill quantities over the years, but now leave it the extra dill as an optional garnish/topping for each individual to choose. This recipe also makes a great batch of freezer feasts (you can read more about those right here). After Mr. CARO and I ate dinner, we had enough food left over to make up 8 Freezer Feast to enjoy for lunch or dinner later. I love a recipe that reheats for yummy leftovers later and this one does not disappoint. Do you have a favorite casserole that you love to make in the dark days of Winter? Feel free to leave a comment or a link to share your recipe! We are in “baking mode” here at our house. We have learned that if we bake all the Christmas goodies too early in December, they are all gone before we get to Christmas Day. So, our new plan is to make one kind of something (pie, cake, cookie, etc.) per evening for the week leading up to Christmas. One batch per night works pretty well so far. It doesn’t seem insurmountable at the end of a busy work day. We can still get other things done each evening, without feeling like we are trapped in frosting sweat shop. In the spirit of a great cookie exchange, I wanted to share with you my favorite created-by-others cookie recipes that I’ve pulled from other websites. These are our favorites that we mix and match in our house and as gifts each year. They are not all “Christmas cookies” but they all mix well together with a classic iced sugar cookie for good variety on a plate. 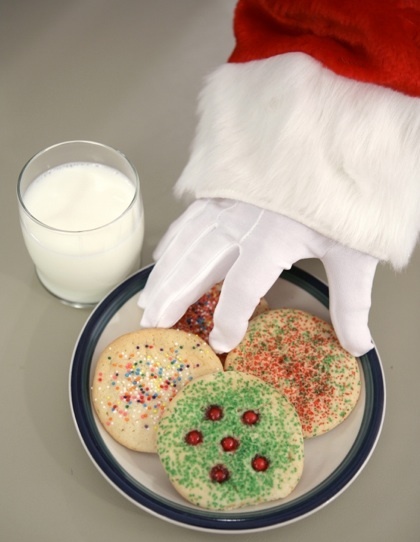 Santa has never complained yet! I’d love to be able to take the credit for these cookies, but I’m too busy trying to get my batches of them to fit in the little holiday cookie containers to have dreamed them up. I hope you enjoy them as much as we do! 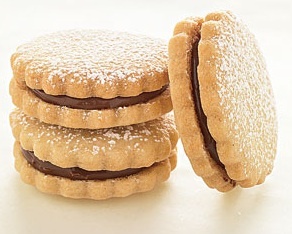 Put simply, these cookies are our excuse to eat Nutella without guilt. You can use any store-bought or homemade sugar cookie dough with this recipe. You can also use any shape of cookie cutter. These cookies travel to parties well, too. Cheesecake flavor in a chocolate chip cookie, need I explain the genius of these cookies further? They are wonderfully chewy! You do need to keep them in the fridge after they are baked, however, or the cream cheese can make the cookies a little sour. Use this recipe all year ’round. I won’t tell! These cookies are little more work, which is not surprising, considering these come from the ever-perfect kitchen of Martha Stewart. However, they are really worth the effort. 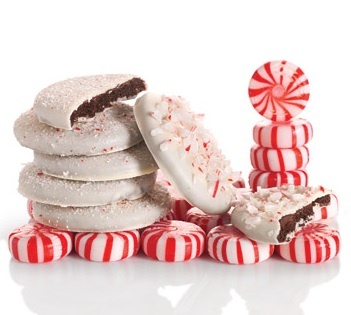 Clean peppermint and a rich chocolate flavor are topped of with crunchy candy cane pieces. They really do look fabulous as a gift or on a table at a party! 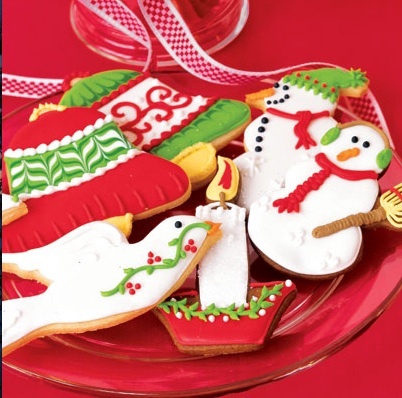 When do you do the holiday baking at your house? Do you have favorite recipes you make every year or do you mix it up? 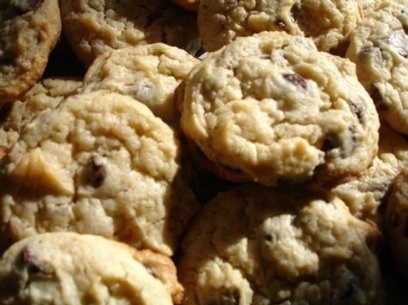 What is your favorite cookie recipe you’ve found online? Feel free to put a link in a comment! We can all use a great cookie recipe! 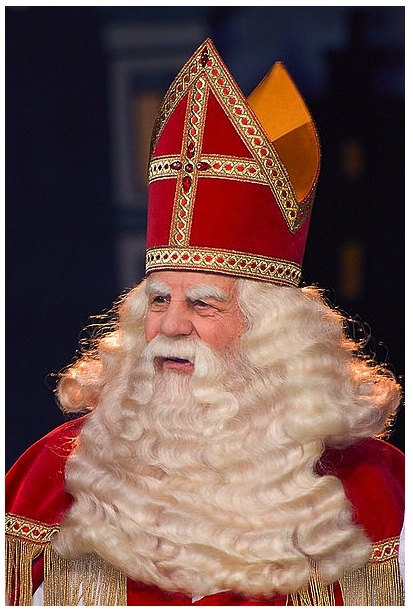 This coming Tuesday is St. Nicholas Day, December 6th. Do you celebrate this holiday in your home? In many parts of the world, people do. Especially children. We have our own, grown-up version of this holiday tradition for this day in our home, which I’ll share with you below. The gift-giving part of St. Nicholas’s biography stems from lots of stories and legends of his kindness to his neighbors. In most cases, he leaves behind a small bag of gold coins (much like the chocolate ones you see in the shoes shown above) to help a neighbor in a financial difficulty. Sometimes these gift bags are tossed through and open window or down a chimney overnight, including one instance where the chimney toss landed the bag into a pair of freshly washed stocking drying by the fire… Sound familiar? Most importantly, the gifts were anonymous, because so no one ever saw them actually delivered. They just appeared, as if by magic, to make someone’s life better. The selflessness of the giver is part of the greater message to give help and happiness to others where you are able. This is still a rather relevant humanitarian message for today’s world, regardless of any more specific religious beliefs. 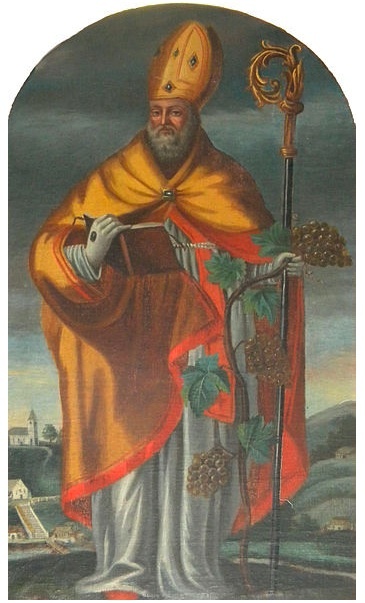 Most countries of Europe celebrate St. Nicholas Day, which is always on his feast day on the religious calendar, December 6th. In many places, St. Nicholas looks like an early step in the evolution of America’s Santa Claus image, half way between the religious bishop portraits and the jolly old elf with reindeer of C. Clement Moore fame. 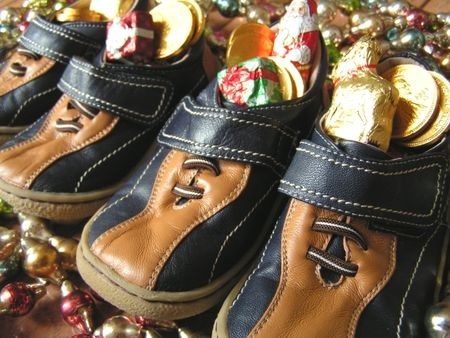 One of the most common ways to celebrate St. Nicholas Day is for children to leave out their shoes, outside their bedroom or outside their house, as they go to bed on the evening of December 5th. 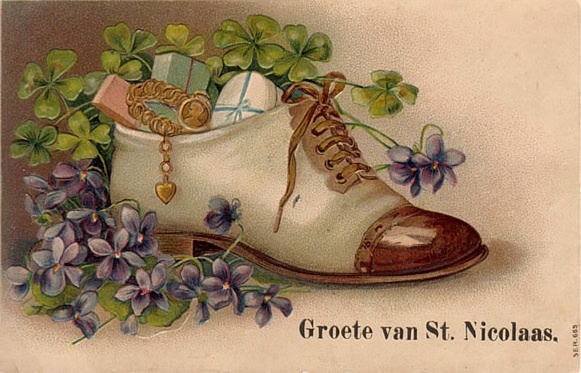 St. Nicholas, Sinterklaas, Père Noël, or whatever his name in each country, will stop by and leave little gifts and sweets in the shoes to be discovered in the morning. It is treated as an opportunity for children to remember how nice it is to get a thoughtful gift and to treat others with kindness and well-mannered behavior. I can imagine that in centuries past, as cold, hard winters beat at the doors in rural communities, kindness and concern for others was an important value to instill in children. Still not a bad lesson for today. I spent several years in Germany as a child and because my parents believed in embracing the other cultures we were lucky to live in, December 6th became a part of our yearly celebrations. As luck would have it, my husband is descended from German American immigrants, so we have kept the tradition going. We don’t have any children yet, but we have evolved the tradition for now to be a small gift to each other with a Christmas theme. This under-$20 gift can be anything to put us in the holiday spirit. Over the past years, they have included books, music, movies, seasonal treats, Christmas ornaments, holiday decor and charitable donations. It is amazing how a little thoughtfulness can help you be mindful of opportunities to help others when they present themselves. Regardless of where in the world we may celebrate Christmas, giving to others is the best gift. 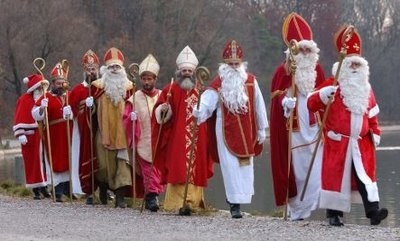 Do you like the concept of a St. Nicholas Day celebration? How do you mark the beginning of the Christmas season in your home? 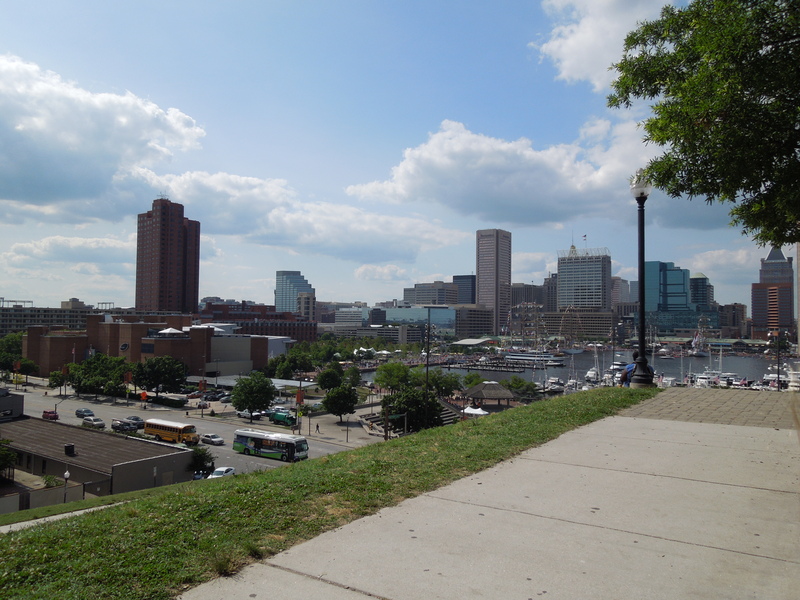 Do you have a favorite way of giving to your community during the holidays? Share your celebration traditions in a comment!